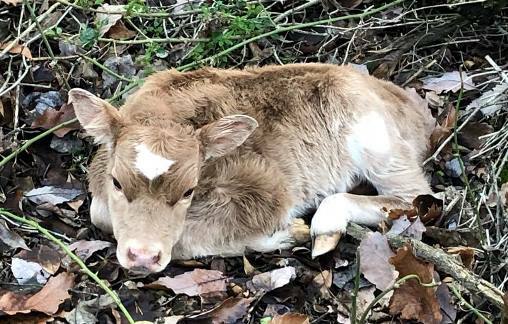 This darling little heifer was calved on 1/18/19. She is purebred mini jersey. 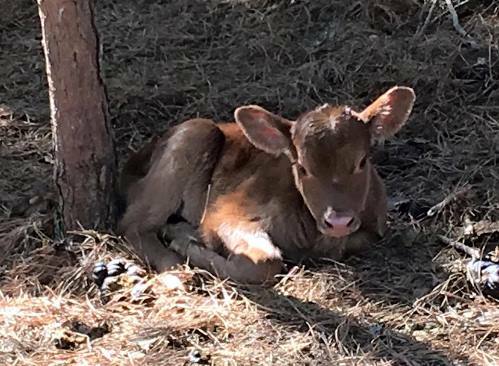 She is just a precious little thing and will make someone a great little homestead cow. I had intended to keep her, but we have some opportunities for the farm at this time, so I am offering her for sale. She will be sold as a bottle calf. 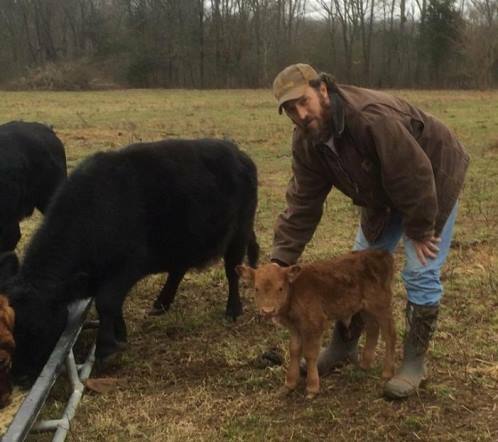 Roger, I hope that you and your family enjoy your new little heifer. This heifer was calved on 8/18/18. 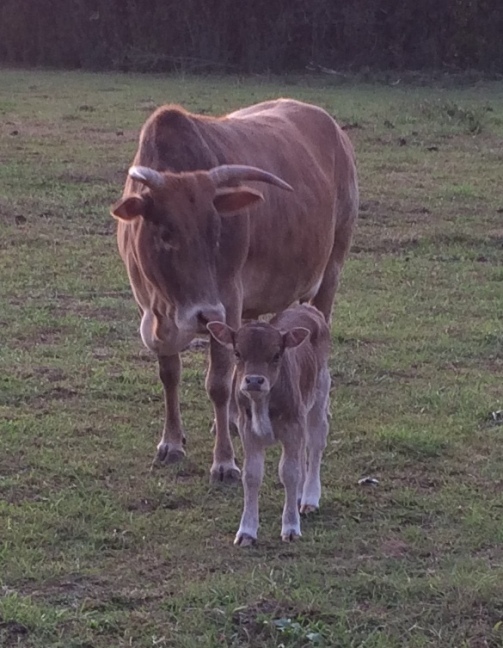 She is out of our largest pure zebu cow and sired by our red Lowline bull, Willie. She should make a very nice brangus type mini cow. I would really like to keep this one, but have retained too many already this year. Charles and Maggie, I hope she is a great little cow for you and is a part of your little herd for a long time. 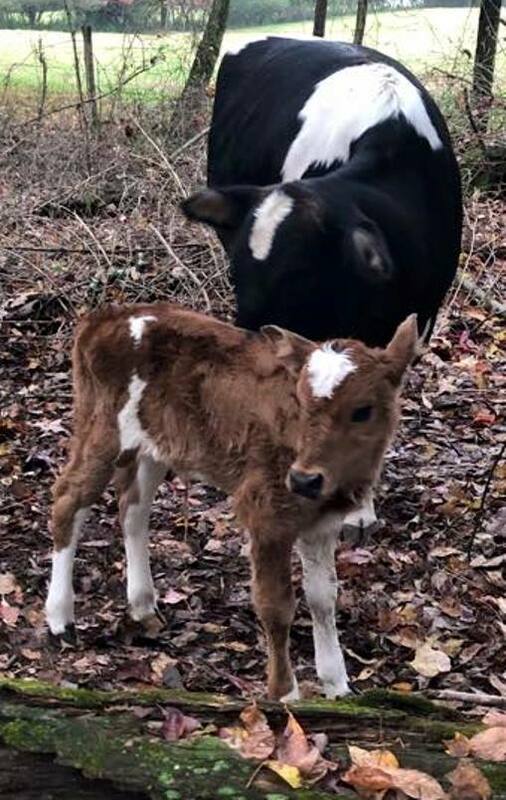 This mini jersey cross heifer was calved on 12/23/18. She is sired by our mini jersey bull Harley. She will be bottle trained and sold as a future milk cow. Richard, I hope that you and your family enjoy this little girl. She should grow into a great little milk cow for you. 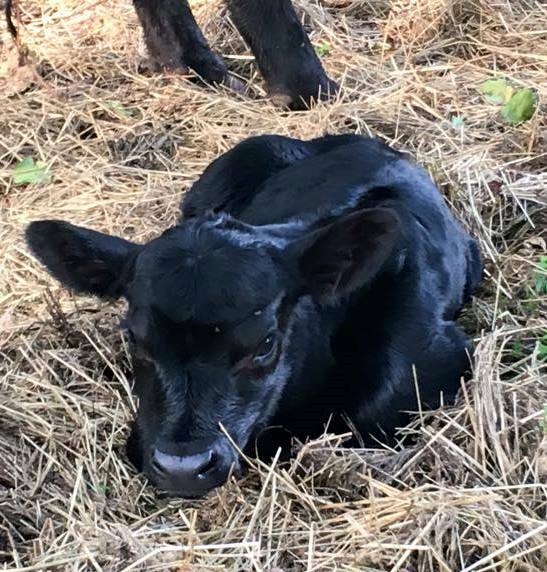 This handsome little guy was calved on 10/14/18. 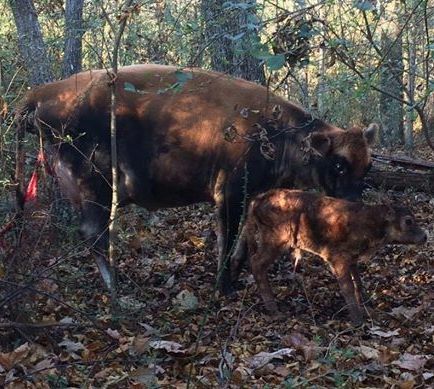 He is out of a guinea Pineywoods cow and is sired by our red Lowline bull Willie. He is polled and should throw color 50% of the time. He should make a great bull for any that likes color. Kelly, I hope that this little guy makes a great bull for you. The cow is also for sale. She will be bred back to Willie. Elaine, I hope that she has a pretty heifer for you . Lacey, the cow, will also be for sale once her calf is weaned. She is great cow and has a nice calf every year. Elaine, I hope they both do as well for you as Lacey has for us. She is a great momma. 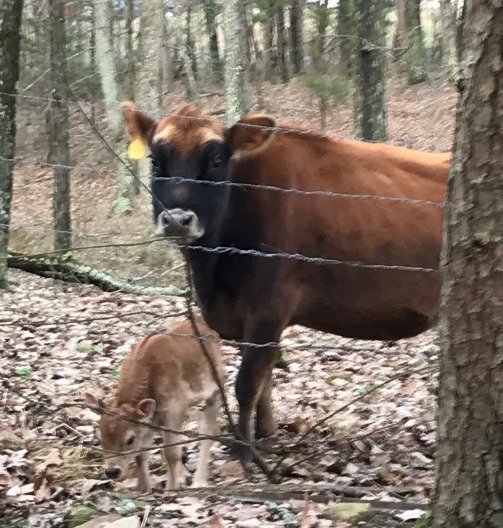 This heifer was calved on Kenneth’s farm on 4/18/18. 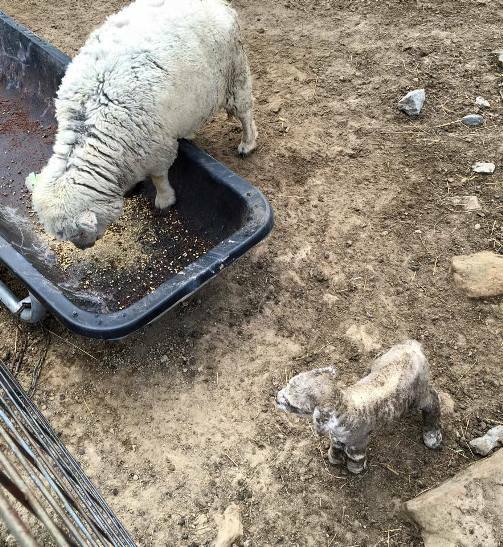 The dam is a small dexter and the sire is a smaller Lowline. He has decided to offer her for sale, $1250. She should make a great little pet or brood cow for someone wanting raise smaller cattle. Lauren, I hope that you are happy with your new little cow. I hope she does well for you. 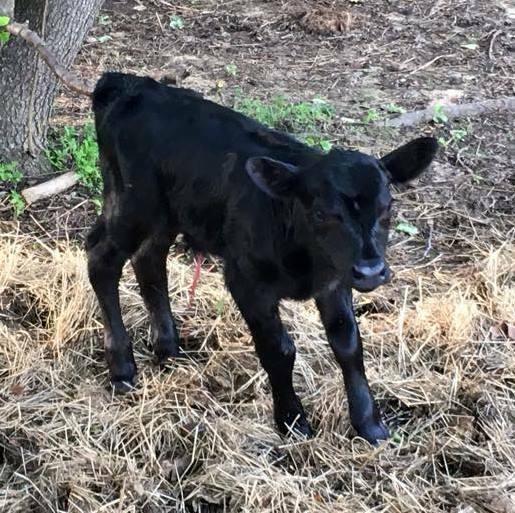 This handsome little guy was calved on 6/19/18. His dam is Clover. She is our family milk cow. She is 3/4 mini jersey x 1/4 dexter. His sire is Tango, our previous mini jersey bull. The calf is 7/8 mini jersey x 1/8 dexter. He should make a great little dairy bull for someone. 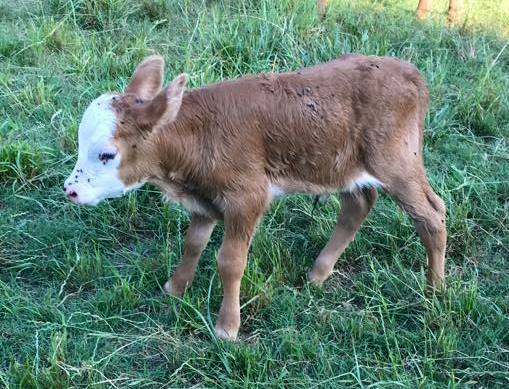 This little guy is a lowline x guinea pineywoods bull calf. He is sired by our red lowline bull Willie and out of a guinea pineywoods cow. He is polled. He should make a hardy little bull. Maggie, I hope he makes a great little bull for you. 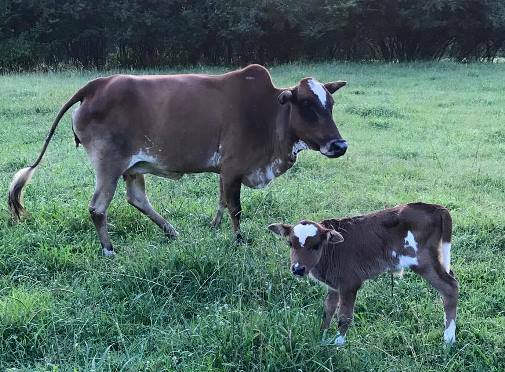 This lowline x zebu heifer was calved on 5/6/18. She is small and a pale brindle color. 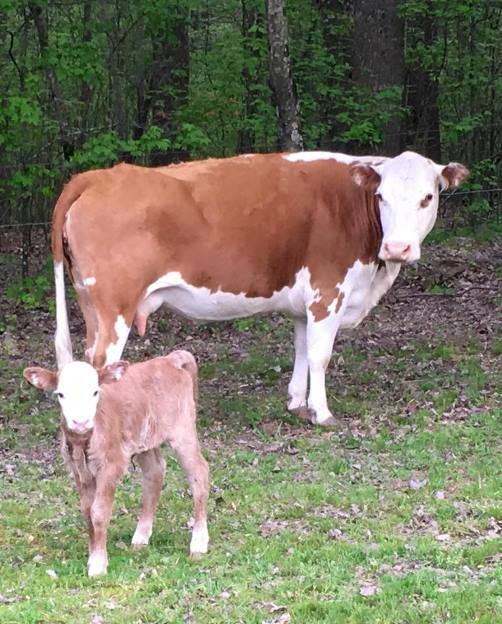 She would pair well with the bull calf from 4/27/18. They are very similar in size and color. 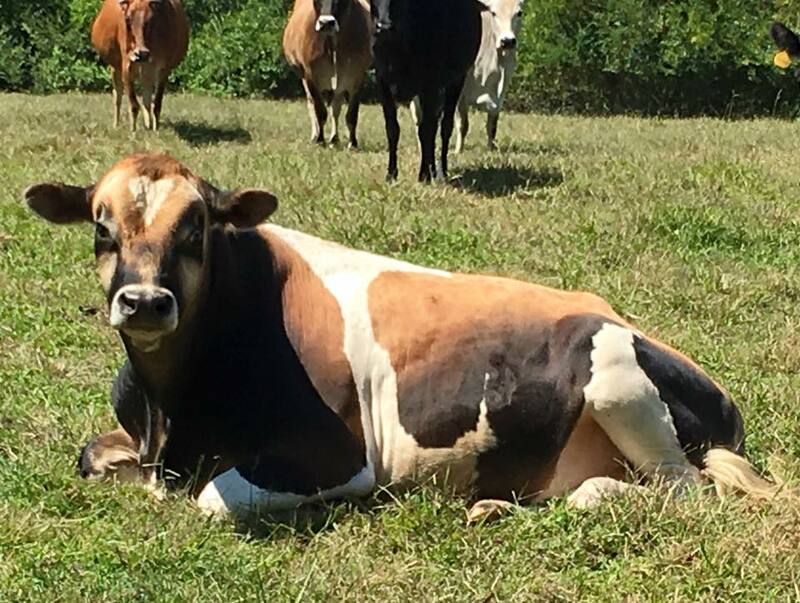 Maggie, I hope she makes a great little momma cow for you . 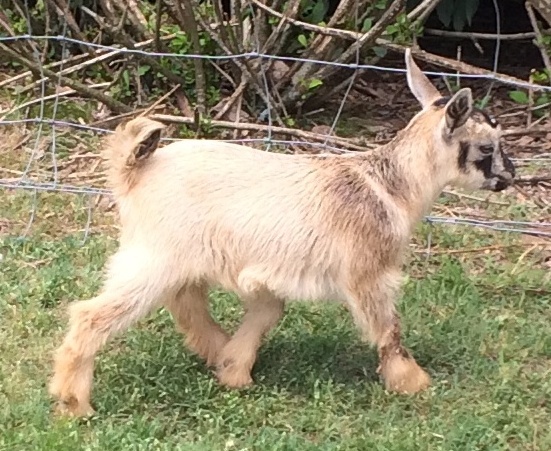 This awesome little guy is 1/2 mini jersey, 1/4 lowline and 1/4 guinea pineywoods. He is sired by our previous mini jersey bull Tango. His dam, a lowline x guinea pineywoods has an excellent and large udder. Some of the pineywoods were used as dairy. I wonder if there is not some in her lineage. Maggie, I hope this little steer exceeds all your expectations. 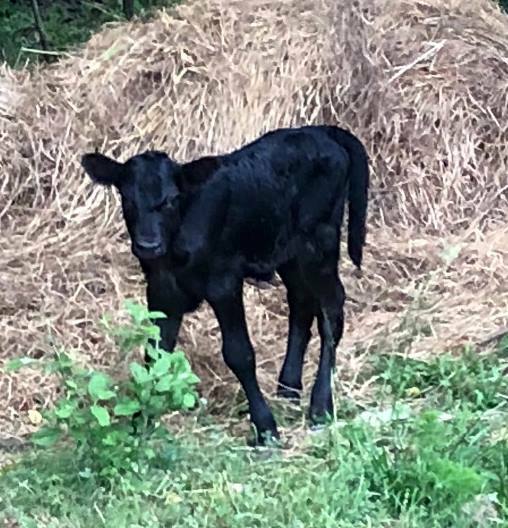 This tiny bull was calved on 6/14/18. He is out of our smallest zebu cow and sired by previous mini jersey bull Tango. 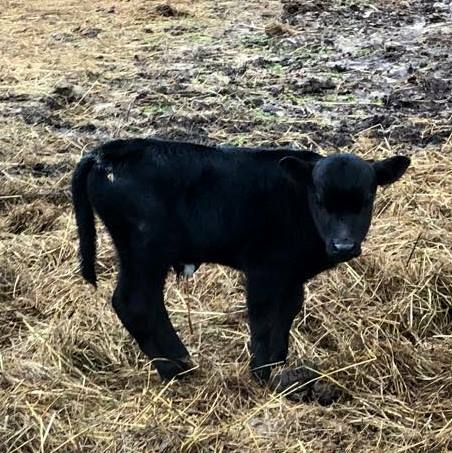 If you are looking for a little bull, this guy is for you. 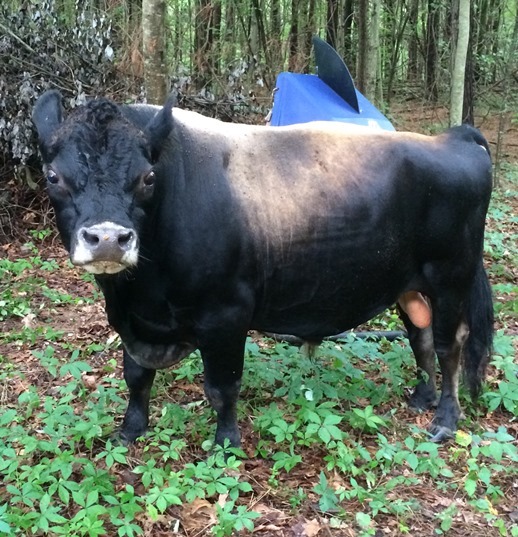 Bull has been DNA tested to be A2/A2. 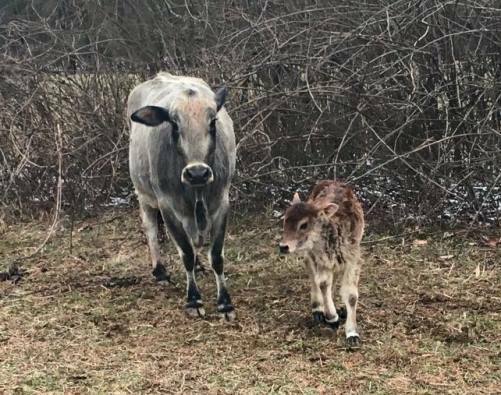 Julie, I hope that he makes a great bull for you. .
On 4-19-18 we had a handsome new mini jersey x Zebu bull calf. He is sired by our previous bull Tango and out of one of our smaller Zebu cows. He should make a nice little bull for someone. Blake, I hope that you enjoy your new boys. 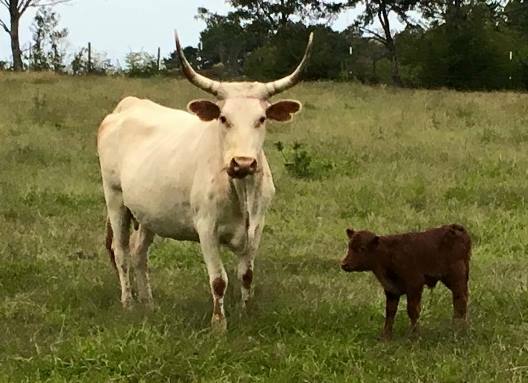 This handsome bull calf arrived on 10/27/17. 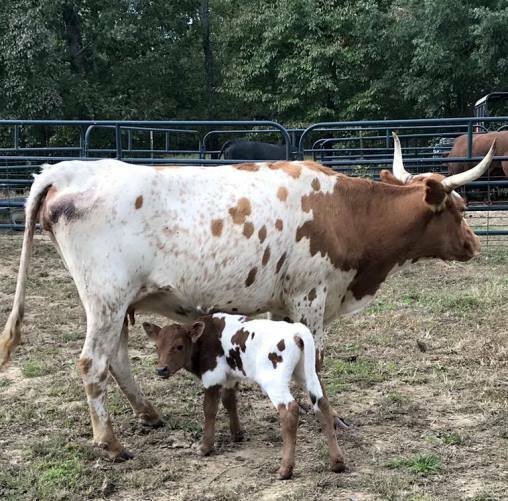 He is sired by our mini jersey bull Tango and is out of a purebred zebu cow. 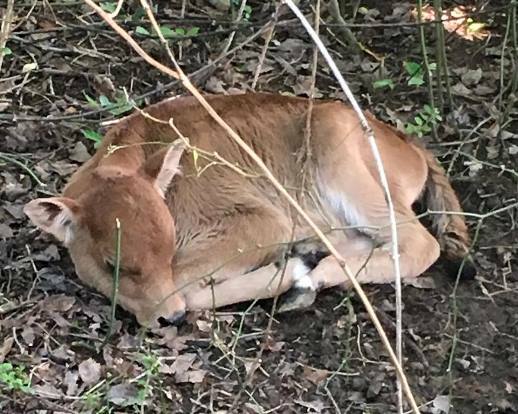 He is fawn except for the markings on his feet and the tip of his tail. This cow calved on 5/2/18. 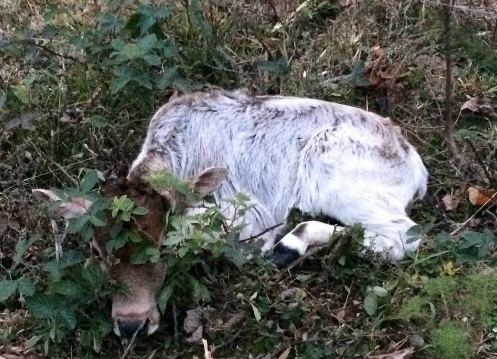 Her calf has been sold as a bottle calf. She should dry up and breed back soon. She can stay long enough to ensure that she is rebred to our new mini jersey bull Harley. John, I hope she has a pretty little heifer for you! This cow calved on 3/2/18. 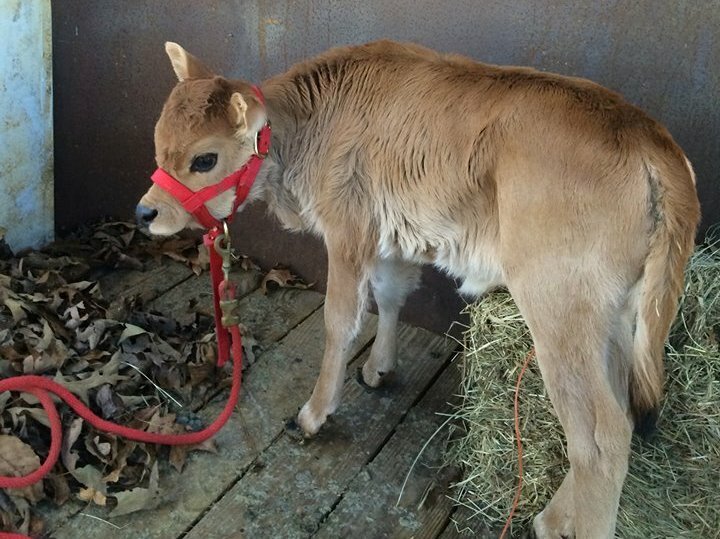 Her calf was sold as a bottle baby, because the customer wanted a pet. She should dry off quickly and rebreed. 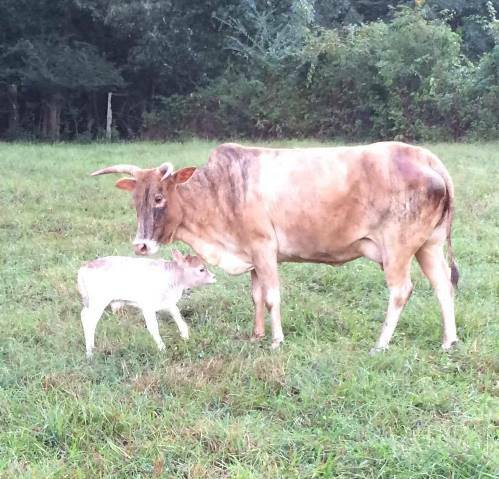 She is pastured with our new mini jersey bull Harley. She can stay long enough to ensure that she has been rebred. We have to make room for retained heifers, so we are offering her for sale, $850. This is CrookedHorn. She has been an excellent momma cow for us, but we must make more room for last years retained heifers. 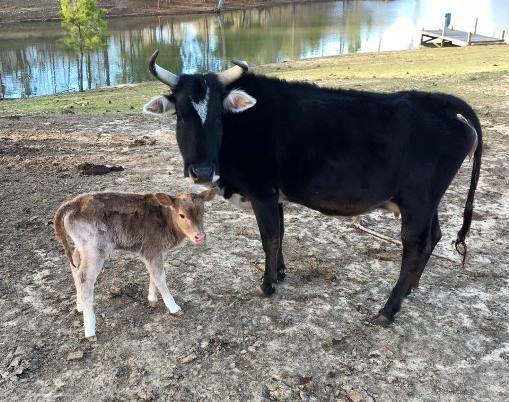 She is pastured with our new Mini Jersey bull Harley. She should be bred soon if she is not already. She can stay until mid to late April to ensure that she gets bred. She is a calm cow but not really a pet. You can walk up to her, but can't usually pet her. 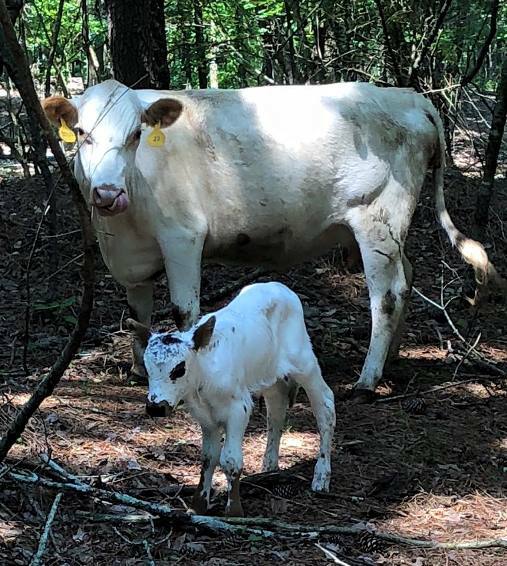 This pretty little heifer was calved on 5/28/18. She is sired by our red lowline bull, Willie. She is out of a cow this is 3/4 zebu and 1/4 mini hereford. 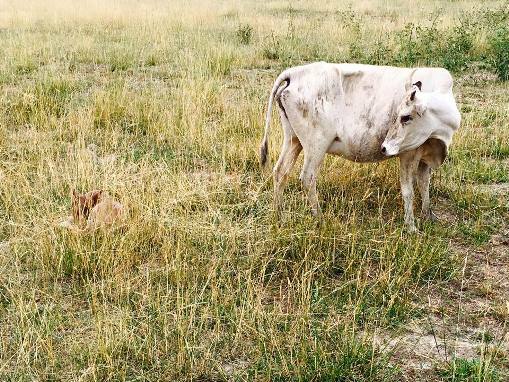 She should grow up to make a dandy little momma cow. Nancy, I hope she does well for you. She should pair great with your little bull. 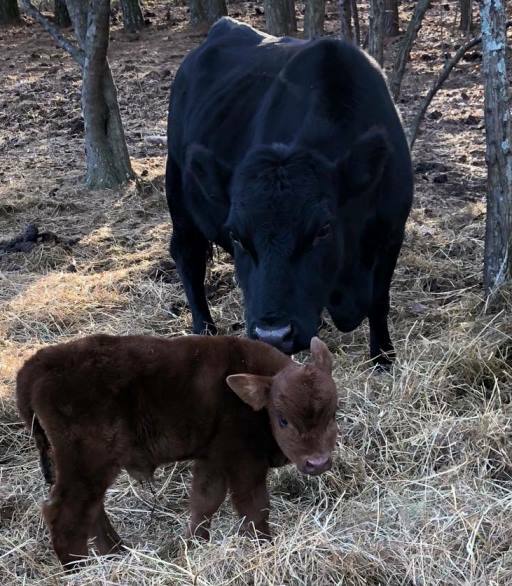 Bull calf calved on 1-30-18. 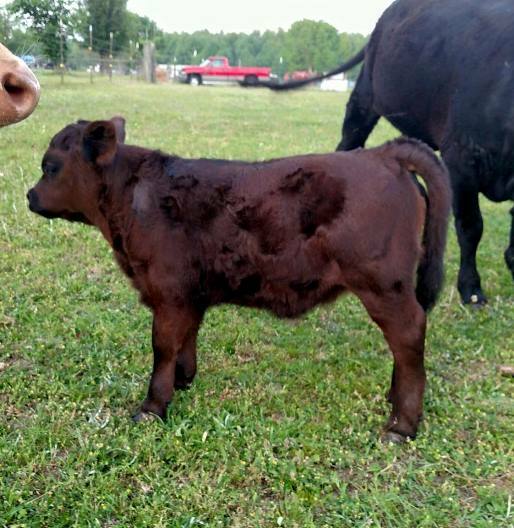 This little guy is 3/4 Lowline and 1/4 red angus. His dam, Anna Belle, is one of our very best cows. He is going to make a great bull for someone. Kenneth, I hope he makes a great bull for you. He certainly has started out that way!. 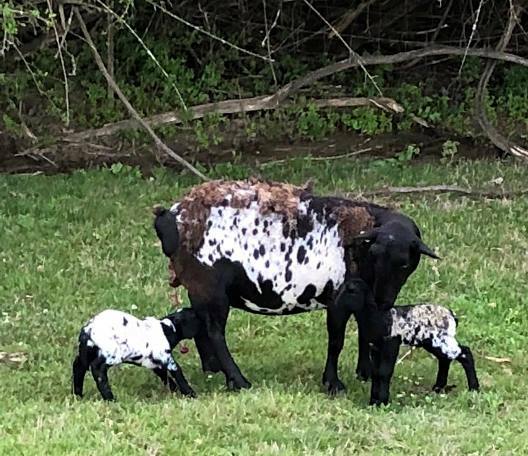 We had twin ram lambs on 4/30/18. They are Katahdin x Dorper. 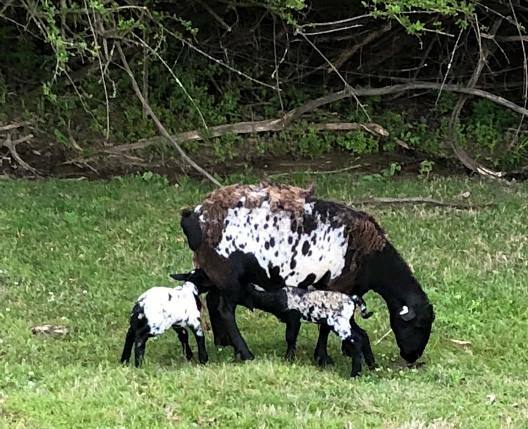 Choice of the lambs is for sale. $150 We will retain the other. They will be ready to wean by the end of June. A deposit will hold until weaning. 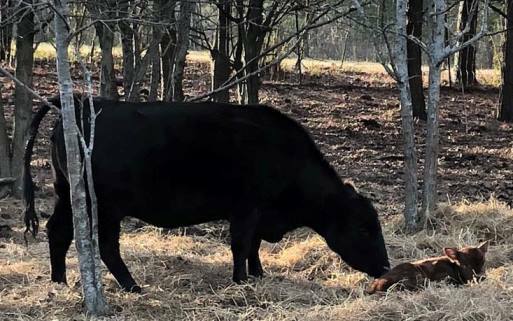 We have a new bull calf on 2/7/18. He is sired by our red Lowline bull, Willie. He is out of a 3/4 Lowline x 1/4 Zebu cow that was raised here. That makes him 7/8 Lowline x 1/8 Zebu. Being sired by Willie, he will have one red gene. So depending on cows he is bred to, he could sire red or black calves. He should make a very nice bull. Christine, I hope he does a great job for you and your growing herd. This is Ms. Pope. She calved in mid January. 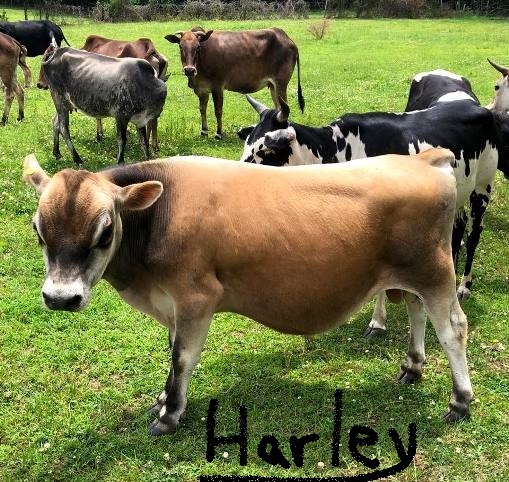 She is open at the moment, but should soon be bred to our new mini jersey bull Harley. She can stay here until the end of March to ensure that she get bred back. She has been a good cow for us, but we need to make room for the heifers that we have retained over the last two years. Maria, I hope that Ms. Pope and the others do well for you. This handsome little bull was calved on 3/2/18. He is out of a pure mini zebu cow. He is sired by our previous mini jersey bull Tango. He is polled and should mature around 40 inches tall. Laura, I hope he makes a great little pet for you. 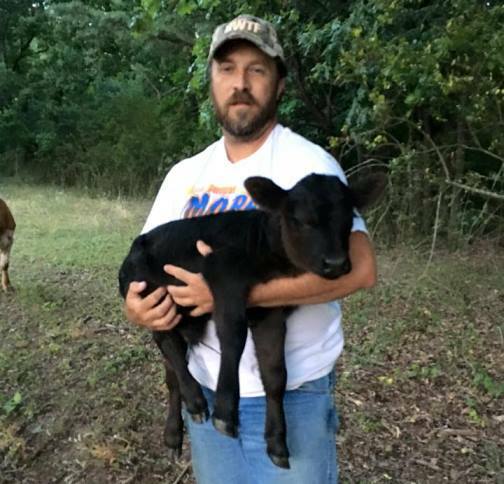 This guinea pineywoods cow calved on 9/11/17. Her calf is sale pending and old enough to wean now. The cow should be bred back to our red lowline bull, Willie, by now. Apryl, I hope she has a pretty little heifer for you this fall. 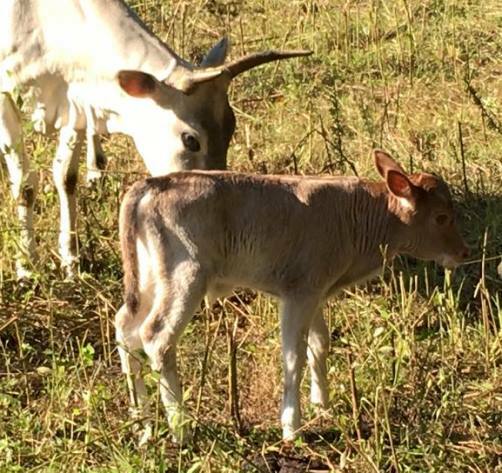 We had a new lowline x zebu bull calf on 8/18/17. He is sired by our red lowline bull Willie. 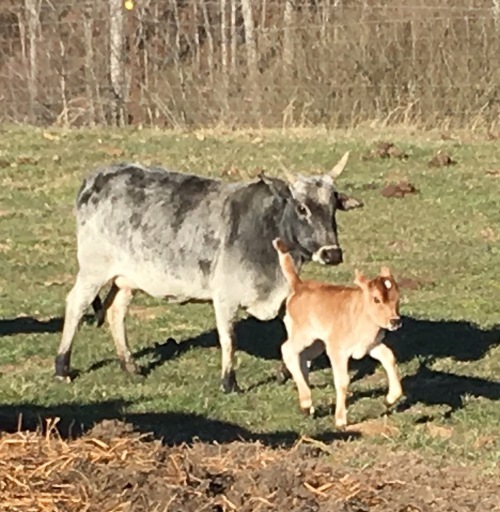 He is out of one of our larger zebu cows. He should mature into a nice sized mini bull. He will likely get the brindle stripping or tiger stripes as he matures. We also have a few heifers like this if you wanted a starter package. Apryl, he should make a great little bull for you. 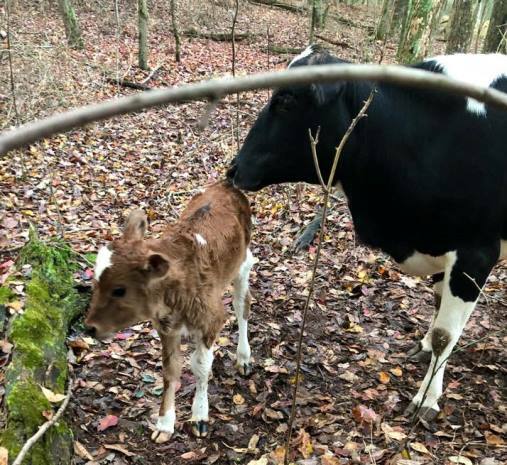 This gorgeous little heifer was calved on 10/21/17. She is out of crossbred mini cow and is sired by our red lowline bull Willie. 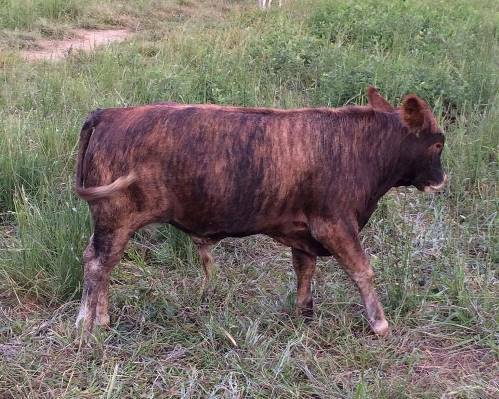 She would pair well with one of the brindle bull calves or the black lowline bull calf below. Ben, I hope she makes a nice little cow for you. This pretty little heifer was calved on 9/11/17. 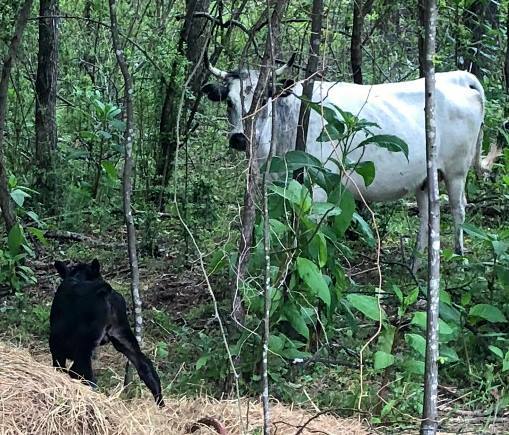 She is out of guinea pineywoods cow and is sired by our red lowline bull Willie. It doesn't show in these pictures but she has a patch of white on her chest. 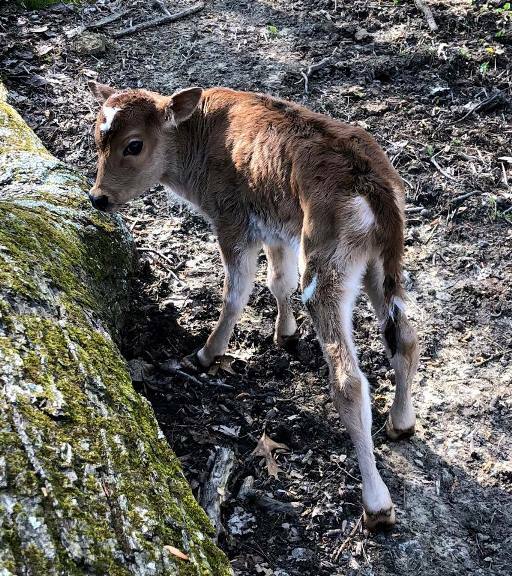 This Zebu cow’s calf was pulled recently to be bottle raised. We are going to offer her for sale to make room in the pasture for retained heifers. She can stay here for another 45 days to give her time to dry up and breed to Willie if desired. Steve, I hope she has a nice calf for you. This lowline cow is 5 years old. Her 3rd calf will be weaned in the next few days. We are offering her for sale to make room in the pasture for retained heifers. She may be bred back to our red lowline bull Willie. 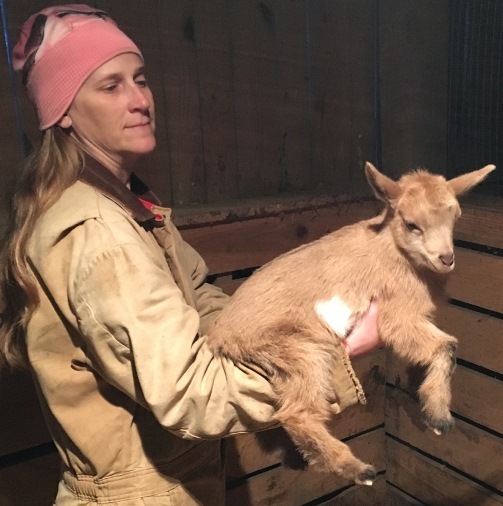 She can stay for an additional 30 days or so to insure that she is bred back if desired. Thanks Pam, I hope she has a beautiful heifer for you. 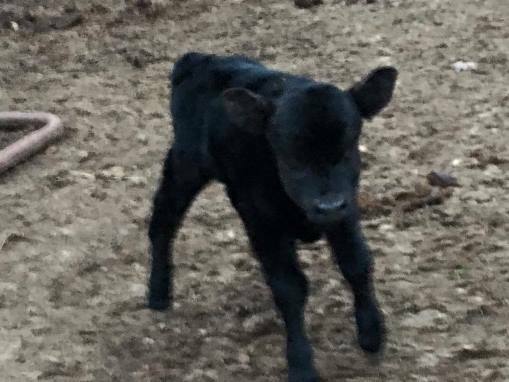 This handsome bull calf was calved on 2/13/17. He is a lowline x zebu. He is sired by our red lowline bull, Willie. We will likely develop the brindle stripping as he matures. He should make a great little herd bull. Bennett, I hope the little streer goes of well for you. 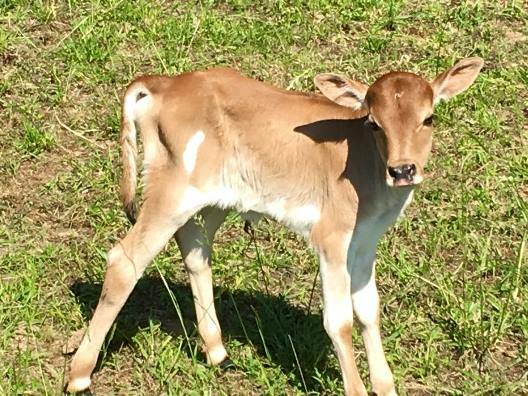 This little guy is a lowline x zebu bull calf. 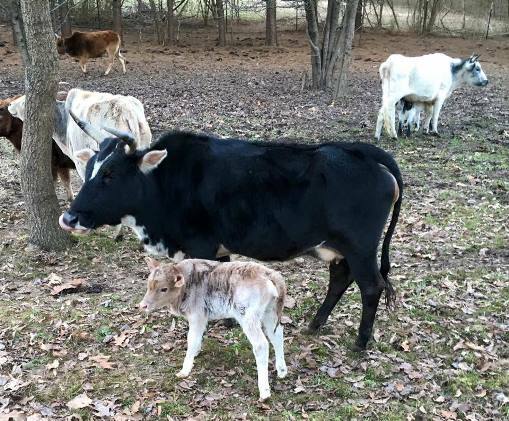 He was calved on 1/28/17. He is sired by our red lowline bull Willie. 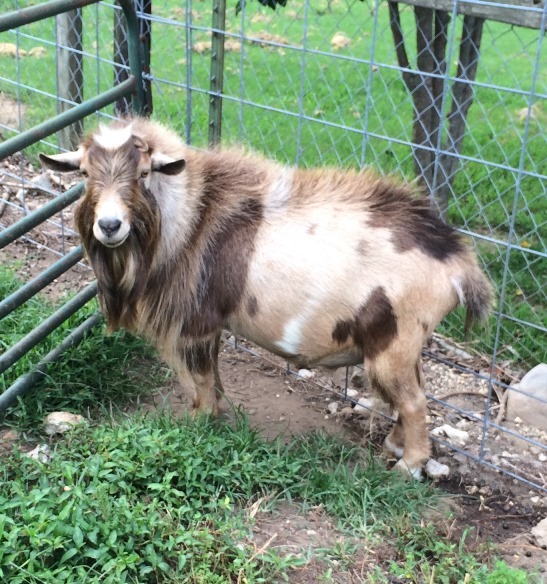 He looks like he will have the brindle stripes as he matures. He should make a nice little beef bull. Bennett, I hope he makes a super bull for you. Penny had a heifer calf on the morning of 6/4/17. Penny has been a good cow for us, but we have retained a number of heifer calves in last two years. We need to sell a few cows to make room for these heifers. 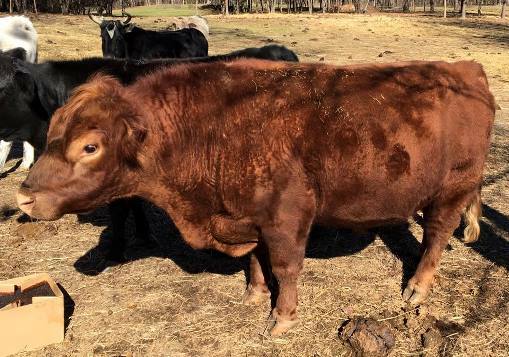 Penny should be bred back to our red lowline bull Willie. Bennett, I hope the heifer makes as good a cow for you as Penny has been for us. Tabitha, I hope Penny does as well for you as she has for us. This beautiful little bull was calved on 11/6/17. He is sired by our previous bull Tango. He is already bottle trained and ready for a new home. He would pair well with the heifer calves from Kenneth's farm listed below. Kelly, I hope that y'all enjoy your new pets. 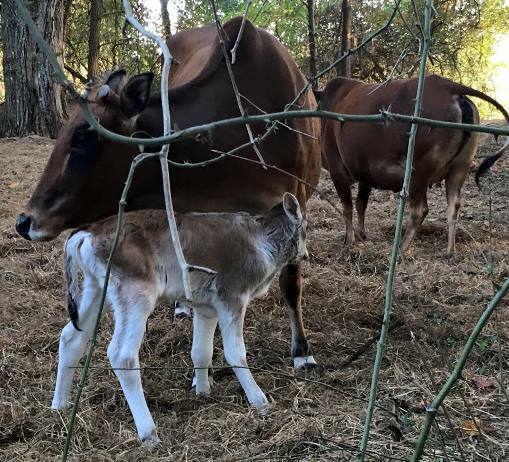 This mini jersey x zebu heifer calf was born on my cousin Kenneth's farm weekending 12/9/17. We will start her on a bottle over the holidays and she should be ready for her new homes by mid January 2018. 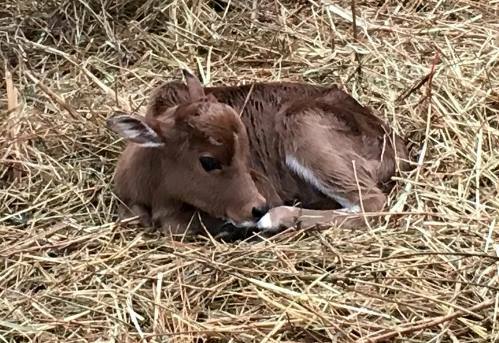 This mini jersey x zebu heifer calf was born on my cousin Kenneth's farm weekending 12/9/17. We will start her on a bottle over the holidays and she should be ready for her new homes by mid January 2018. She is unrelated to our bull cales listed above and below. Rachel, I hope she does as well as the bull calf has. 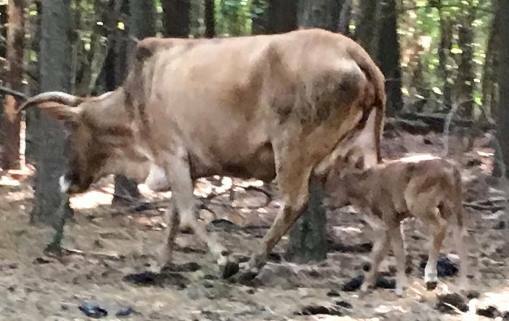 This purebred lowline bull calf was calved on 8/22/17. He is sired by our red lowline bull, Willie. 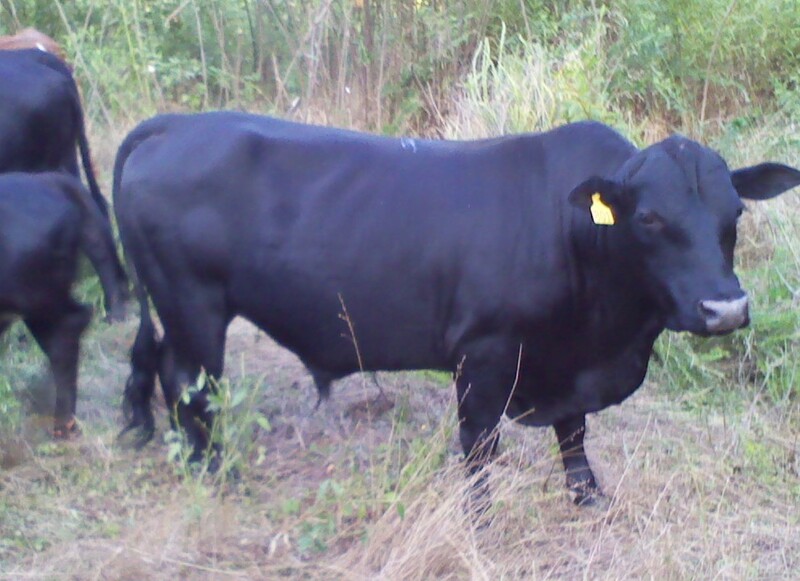 So he is black, but carries a red gene, so he can sire both red and black calves depending upon what he is bred to. John, I hope that he grows into a nice little herd bull for you. .Rachel, I hope he makes a great little pet and herd bull for you. 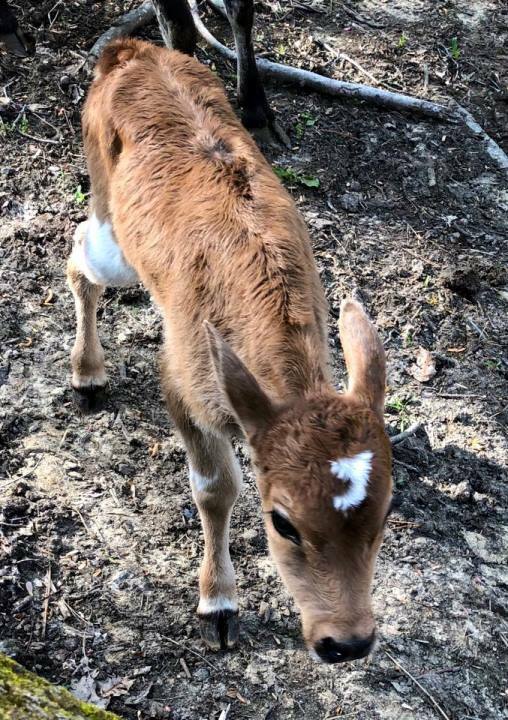 This miniature jersey x zebu bull calf was calved on 7/13/17. He is sired by our mini jersey bull Tango. 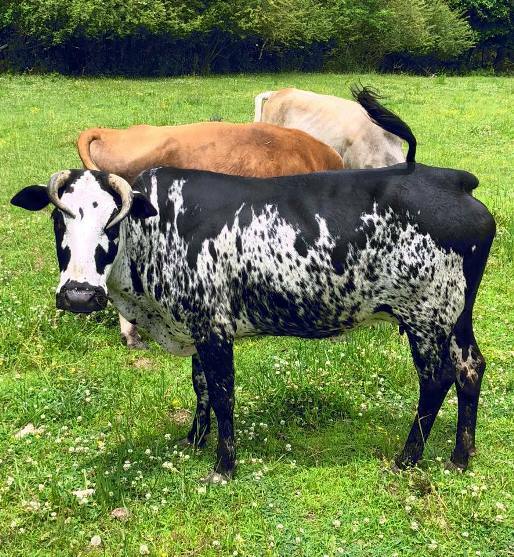 He is naturally polled and as you can see quite colorful. He should make a great little herd bull for someone. Ben, I hope he makes a great little bull for you. 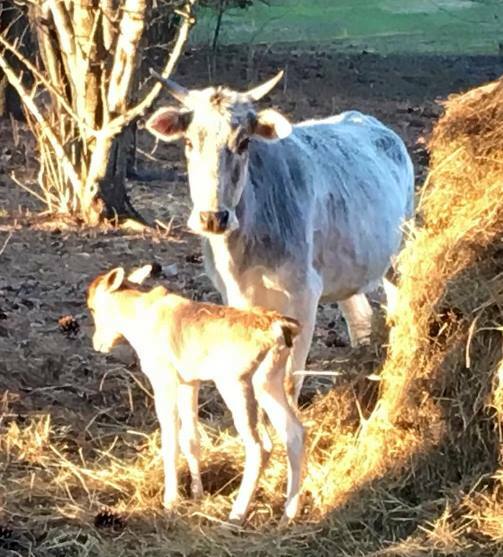 This lowline x zebu heifer calf was calved on 12/23/16. She is sired by our red lowline bull, Willie. She will be a dark brindle when she matures. 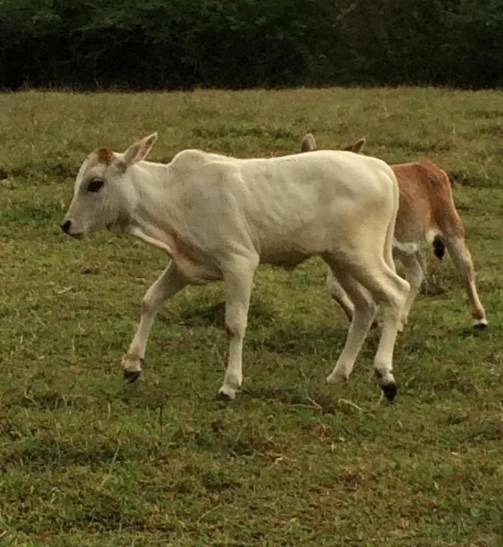 These lowline cross zebu heifers will make great long lasting momma cows, just like F1 brangus in large cattle. Ben, I hope she has many pretty calves for you. This handsome little fella was calved on 6/7/17. He is sired by our current miniature jersey bull, Tango. His dam is a cow that was raised here on our farm. 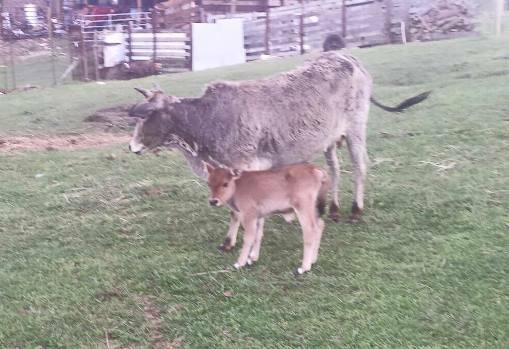 She is 1/2 miniature jersey and 1/2 zebu. 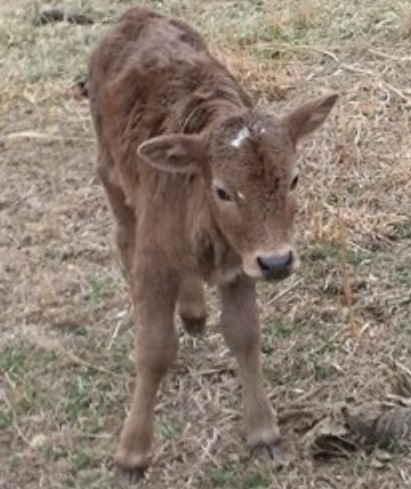 This bull calf can be registered with the AMJA if desired. 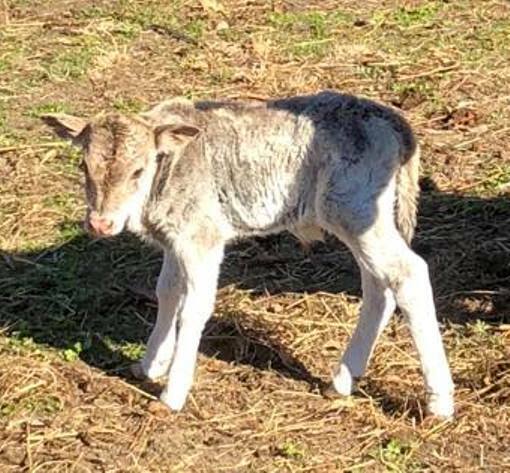 He is 3/4 miniature jersey and 1/4 zebu. He will be polled. Marti, I hope both calves do great for you. That pair should produce an awesome little dairy animal. The heifer on the left was calved on 4/19/17. She was sired by our previous bull Remy and out of zebu cows. 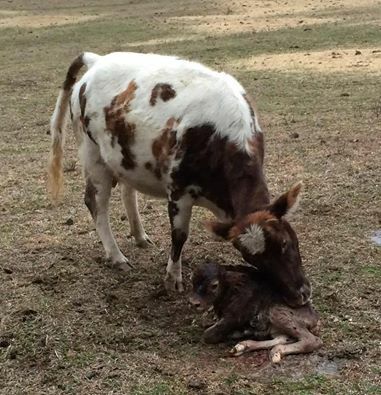 She was calved on my cousin Kenneth's farm. One of our homegrown cows had a nice little bull at feeding time on 4/13/17. He is sired by Willie, our red lowline bull, so he carries one copy of red. This means he can sire both red and black calves depending upon the cows he is bred to. 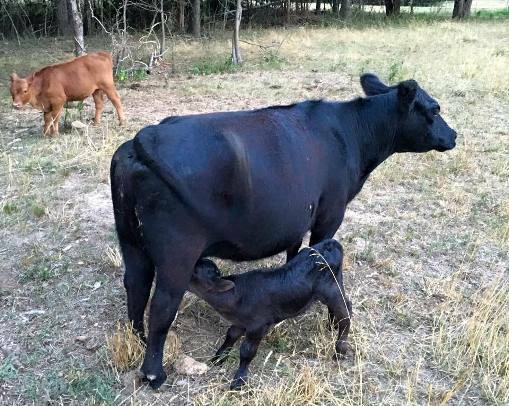 This cow is a great momma and out of cow that is great momma as well. He should make a nice little herd bull for someone. John, I hope he sires the kind of calves you are wanting. He should be a great match for your cows. This heifer was calved on 5/31/17. 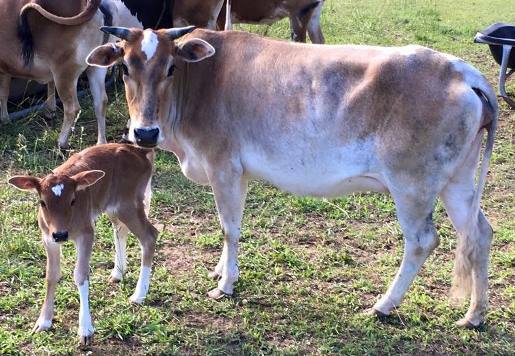 She is 1/2 mini jersey x 1/2 mini zebu. She is sired by our mini jersey bull Tango. Tango is A1/A2. 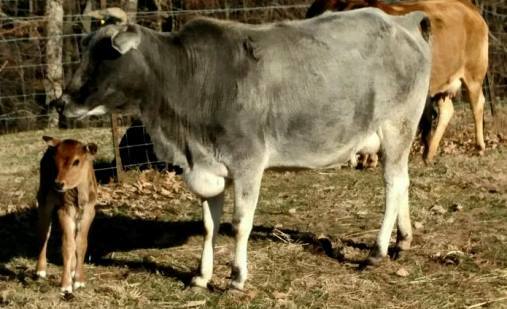 The dam, a pure zebu, should be A2/A2, though she has not been tested. Reference paragraph three of http://www.naturalnews.com/023752_cows_lactose_intolerance_casein.html . So there is a chance that this pretty little girl is A2/A2. She will be bottle trained and should be ready to go to her new home by the end of June. 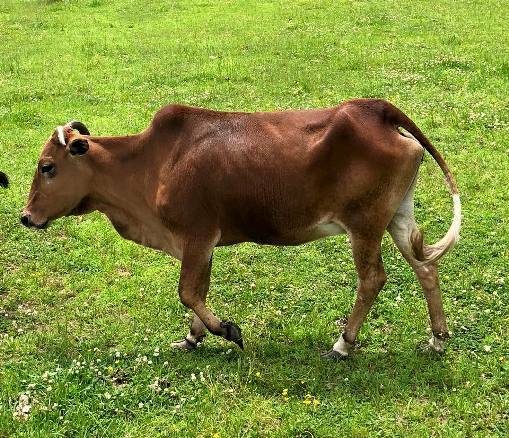 Brandy, I hope she makes a great little milk cow for you. Tango is handsome "mid-sized" jersey bull. He is homozygous for the polled gene, so all of his calves will be polled, even from horned cows. He is A1/A2. So far, he has sired 16 calves, with 12 being heifers. He has grown to be a little larger than we wanted. He is around 47 inches tall. Todd, I hope he does as well for you as he has for us. He should sire some beautiful calves with your cows. This handsome little bull was calved on 12/16/16. He is sired by our previous mini jersey bull, Remy. He is out of a zebu cow. He will make a nice little bull or pet for someone. Wade, we hope he does a good job with your Dexter cows. 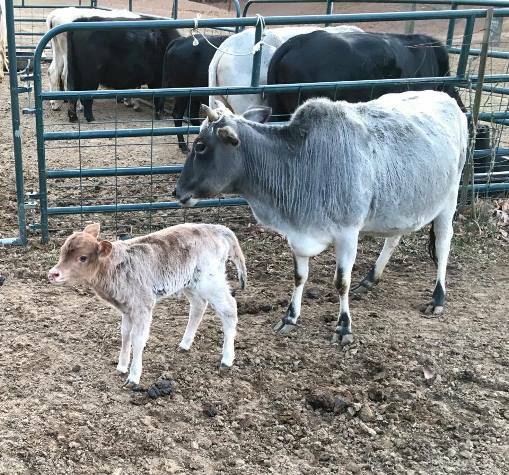 This lowline x zebu heifer calf was calved on 2/21/17. She is sired by our red lowline bull, Willie. She will be a dark brindle when she matures. 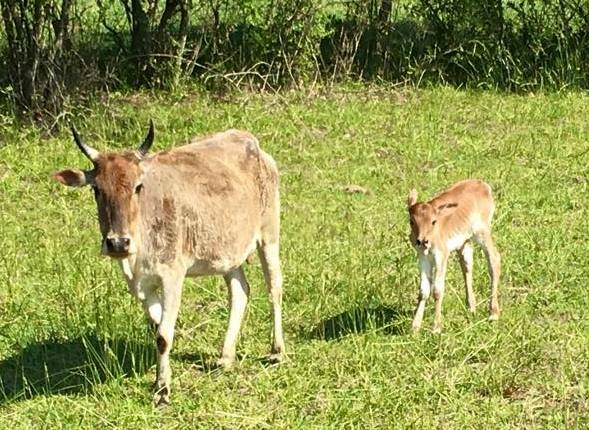 These lowline cross zebu heifers will make great long lasting momma cows, just like F1 brangus in large cattle. Ruby, I hope she makes a nice little pet for you. This little bull snuck in on us. I didn't think his dam was that close but I guess she showed me. 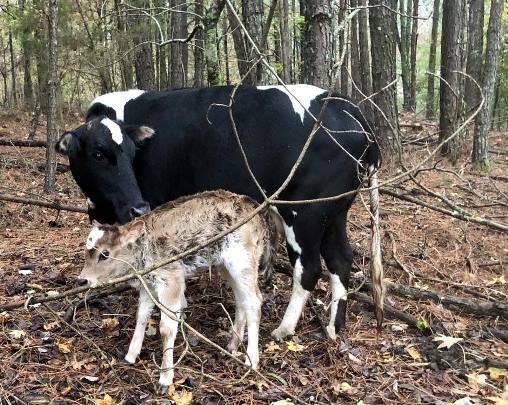 The cow was born and raised on our farm. 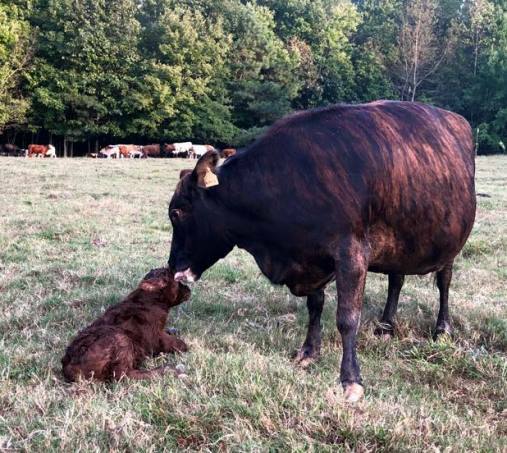 She is out of our lowline x red angus cow, Annabelle. She was sired by our old bull, Cleburne. 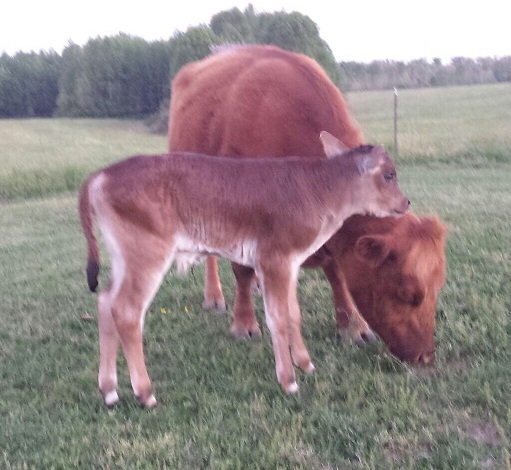 So she is 3/4 lowline/red angus x 1/4 zebu. The bull calf is sired by our red lowline, Willie. 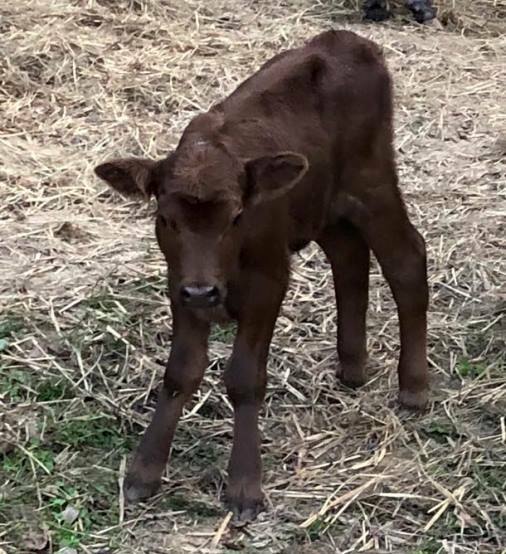 That makes this little guy 7/8 lowline/red angus x 1/8 zebu. If goes off to be anything like his parents, he is going to be an awesome herd bull for someone. Franklin, I hope he does a great job for you. 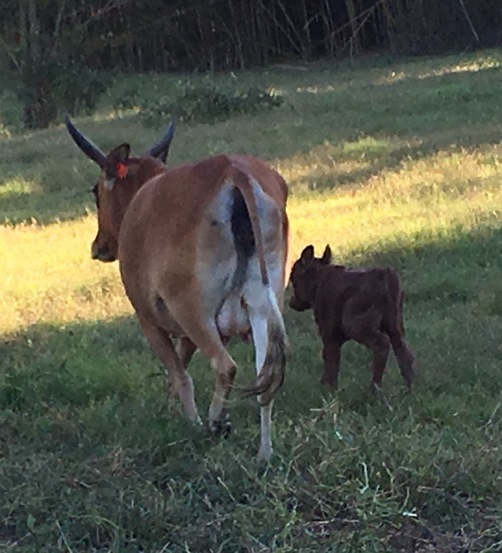 This red zebu cow calved back in October. It is time to wean her calf. We have decided to sell this cow to help make room for the heifers that we retained from last year. She should be bred back to Willie, pictured to the right for a 2017 fall calf. She can stay here until the first of April to ensure that she is bred if you wish. Franklin, I hope she has a nice little calf for you. This cow will also be for sale once her calf is weaned. By this time, she should be bred back to Willie. Franklin, I hope she has a nice calf for you. 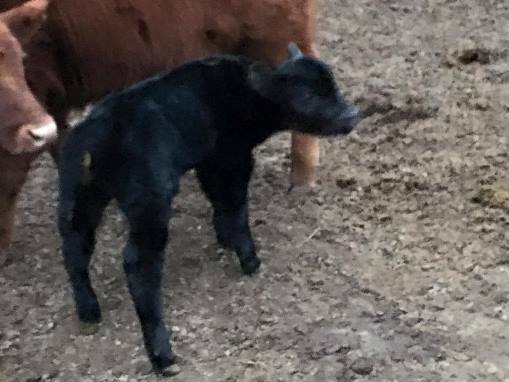 This little bull was calved at Kenneth's on 2/26/16. He is pictured with his dam and his sire, Jake, is pictured to the right. Keith, Kenneth and I hope this young bull does a good job for you. This heifer was calved on 5/26/17. 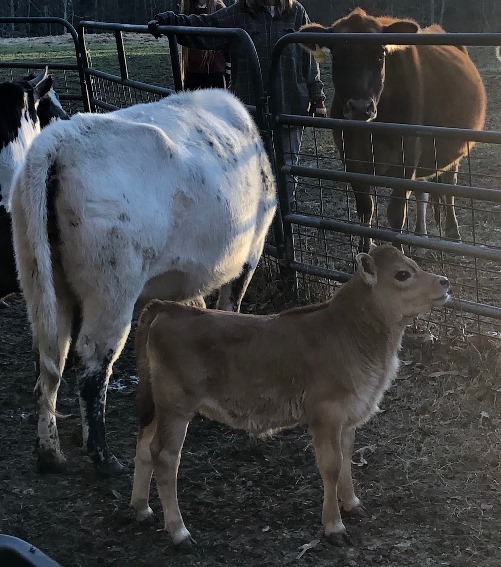 She is 1/2 mini jersey x 1/2 mini zebu. She is sired by our mini jersey bull Tango. Tango is A1/A2. 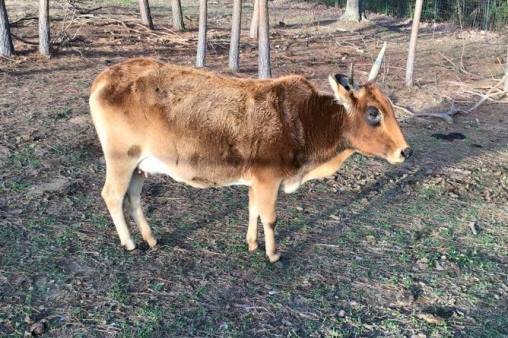 The dam, a pure zebu, should be A2/A2, though she has not been tested. Reference paragraph three of http://www.naturalnews.com/023752_cows_lactose_intolerance_casein.html . So there is a chance that this pretty little girl is A2/A2. She will be bottle trained and should be ready to go to her new home by the end of June. She is a little smaller than the one from 5/25/17. Trish, we hope you are happy with your new little heifers. This heifer was calved on 5/25/17. 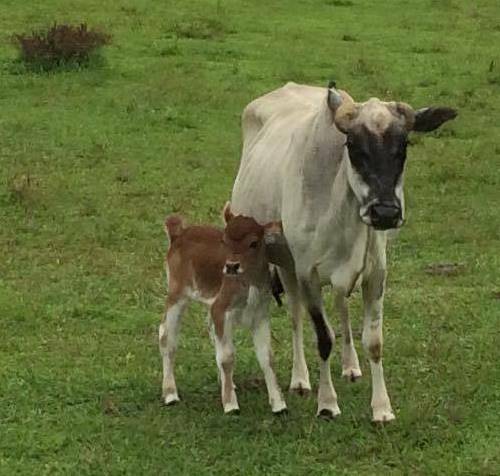 She is 1/2 mini jersey x 1/2 mini zebu. She is sired by our mini jersey bull Tango. Tango is A1/A2. 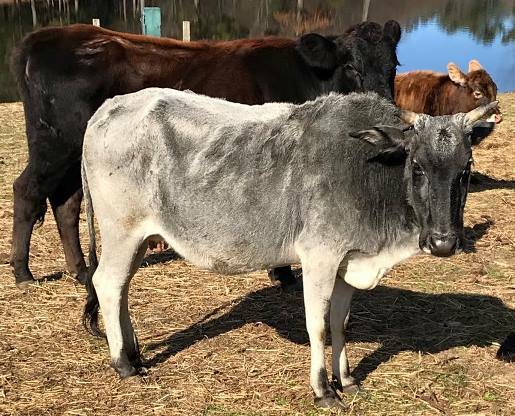 The dam, a pure zebu, should be A2/A2, though she has not been tested. Reference paragraph three of http://www.naturalnews.com/023752_cows_lactose_intolerance_casein.html . So there is a chance that this pretty little girl is A2/A2. She will be bottle trained and should be ready to go to her new home by the end of June. This pretty little heifer was calved on 2/10/17. 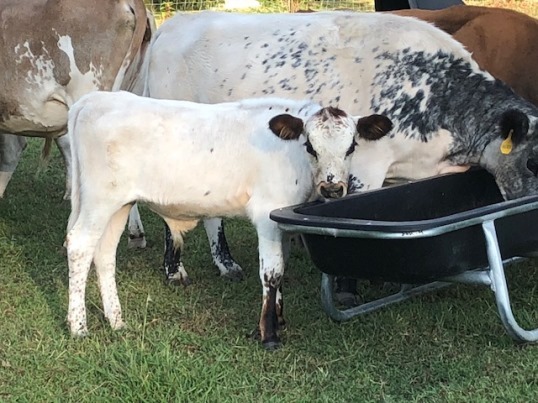 She is a lowline x zebu and will make a dandy little cow for someone. She pictured with her dam to the right and is sired by our red lowline bull, Willie. She should develop the brindle stripping as she matures. We have had several of these little girls this year, I wish that I could keep them all. Danny, I hope she make a great little pet for you. This pretty little heifer was calved on 12/15/16. She is sired by our lowline bull, Willie. She is out of Lacy, a crossbred mini cow. Lacy is in the picture to the right. 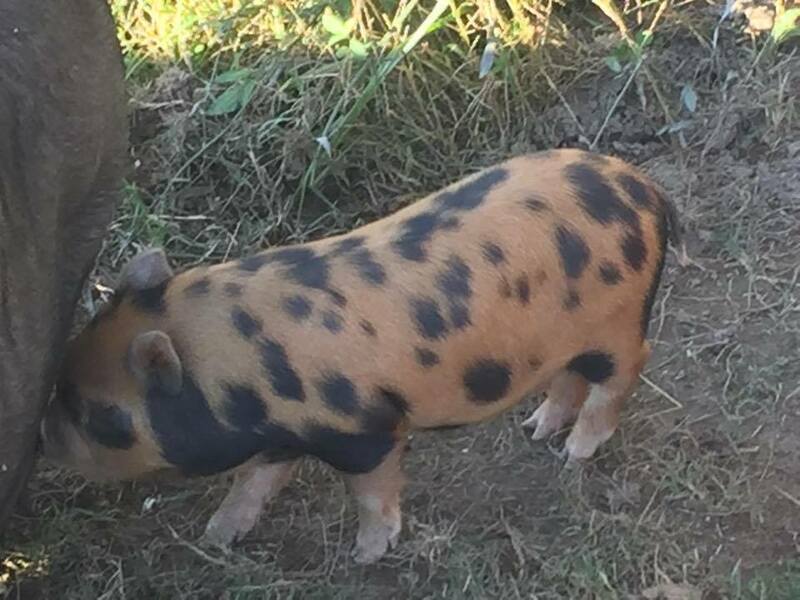 She is a unique color and with the dark colored nose, I am not sure if she will developed any brindle stripes or not. I wish we could keep her , but just can't at this time. Thanks Barry. I hope you are happy with your new little herd. 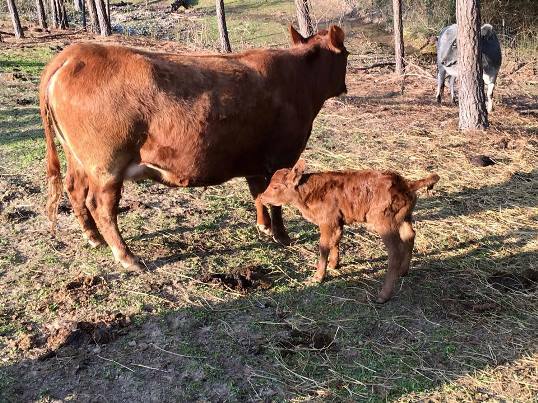 Annabelle, a lowline x small red angus cow, had a heifer calf at feeding time on the afternoon of 1/5/17. The calf is sired by Willie, our red lowline bull. So she is 100% lowline or angus. She will make a beautiful cow in just a little while. 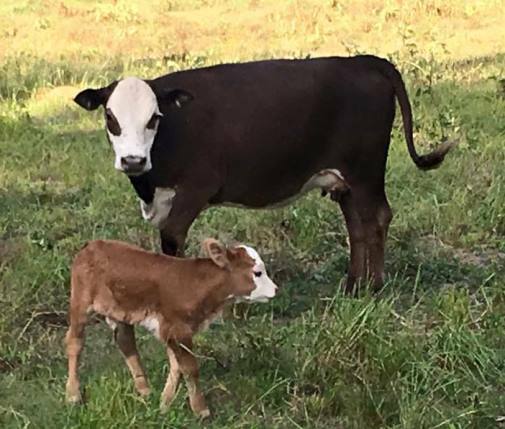 This handsome little bull is out of a 3/4 mini hereford x 1/4 zebu cow and is sired by our red lowline bull, Willie. That makes him 1/2 lowline, 3/8 mini hereford and 1/8 zebu. He should make a thick mini bull. He would be a great mate to some of our 1/2 lowline x 1/2 zebu heifers. 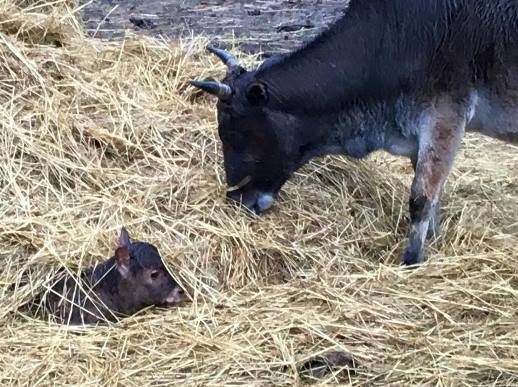 Miniature Jersey x zebu bull calf. Calved on 10/4/16. He is sired by our previous bull Remy. He will be ready to wean early February. Thanks, Todd. 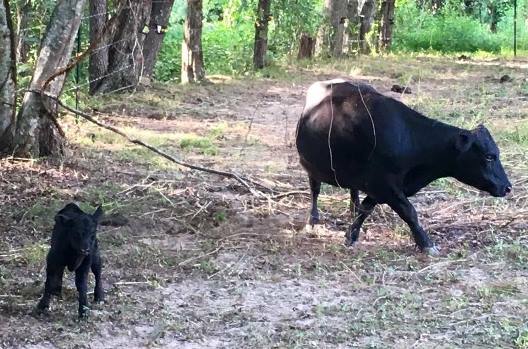 I hope the bull calves do well for you. 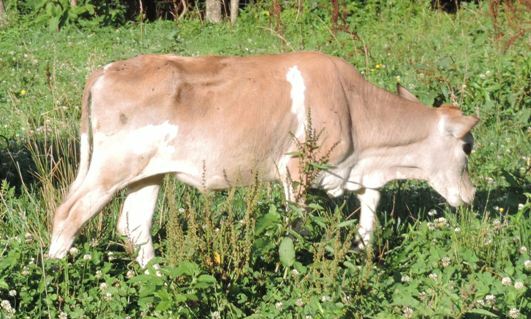 This Strawberry, a pure zebu cow that we have had for several years now. She has been a good cow for us and has raised a nice healthy calf every year. We retained 8 miniature jersey cross calves last year and must make room in the breeding pasture for them. So we are offering her for sale. She will be available after she weans her calf, sometime in May. By that time, should be bred back to our current miniature jersey bull Tango, pictured to the right. Greg, I hope she makes a great cow for you. 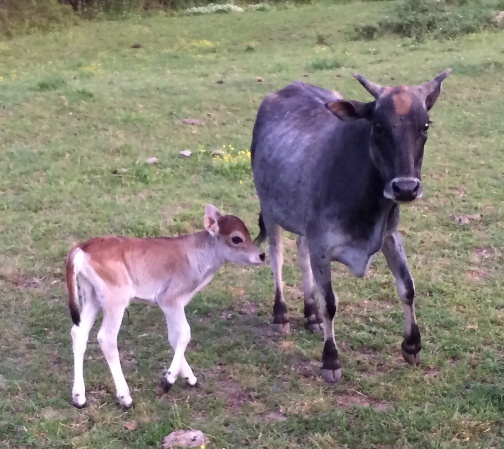 This little red zebu cow is also too small for our program. She should be bred for a late fall calf. She is also bred to Tango. 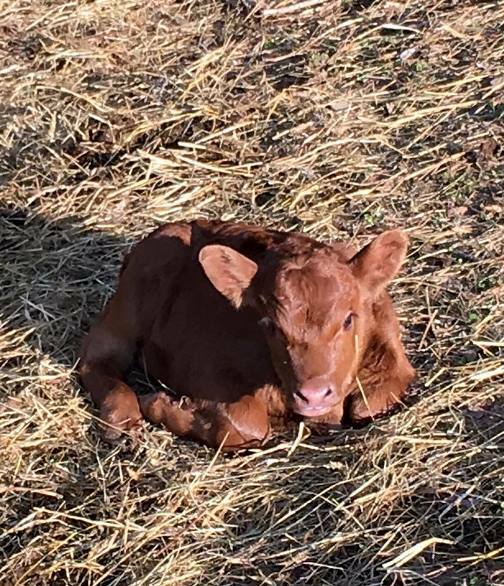 She had a pretty little red heifer calf last year. Meg, I hope she is great little cow for you. This is "Tiny". She is a little girl and we have decided that she is really too small for our program and what we are trying to raise. She had a very small heifer last year. She should be bred to tango for a summer calf. Kimmy, I hope that she is a great pet for you and that she has you a beautiful little calf soon. This handsome little guy was calved on 9/13/16. He is 1/2 lowline x 1/2 mini zebu. He would pair well with the heifer above. He is polled, no horns. Dale, I hope he makes a nice mate for your heifer. Thanks. 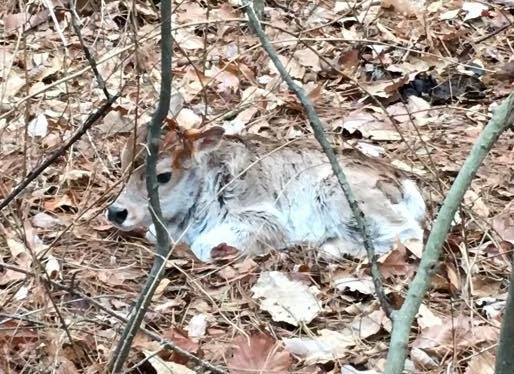 This little bull calf was born on 12/26/16. He is out of cow #523 and is sired by our previous mini jersey bull, Remy. He will be polled and should make a nice little bull. Lee, I hope he make a nice little bull for you. Hopefully he will help you get the size down like you want. 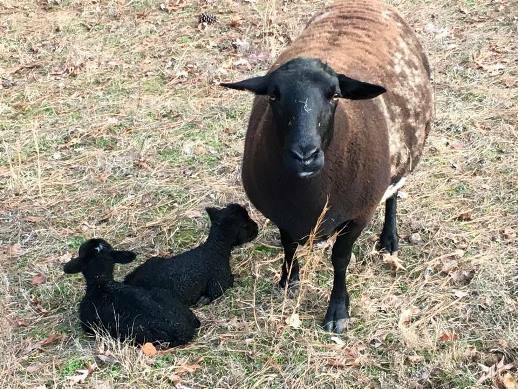 These ewe lambs were lambed on 2/17/17. They are pictured with their dam, a katahdin x dorper. They are sired by a registered babydoll ram. I wish that they had been ram lambs so that we could raise them to go into the freezer. Joe, I hope these girls do well for you. This pretty little heifer was calved on 12/21/16. She is sired by our previous mini jersey bull, Remy. 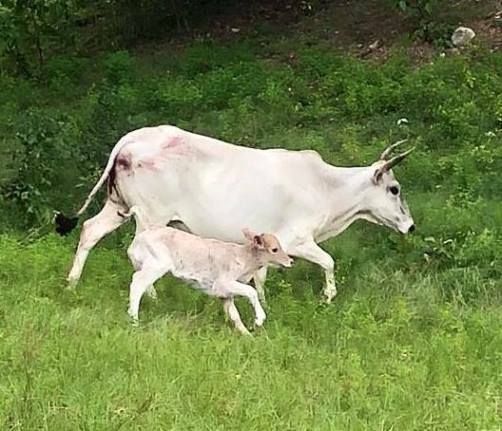 She is out of Ziva, a zebu cow. Ziva is 40 or so inches tall, which I think is ideal for these little cows. 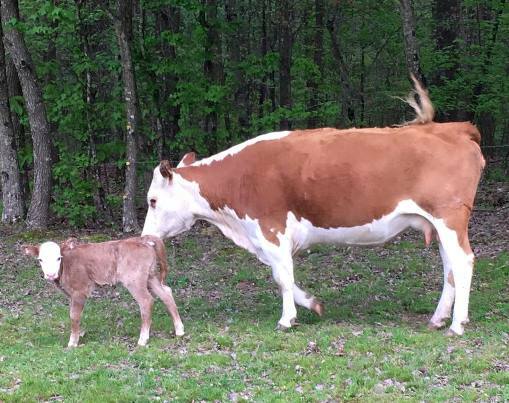 Her calf should mature to about the same height. Maggie left for her new home on 3/2/17. Joe and Terry, I hope she makes a wonderful little milk cow for you. 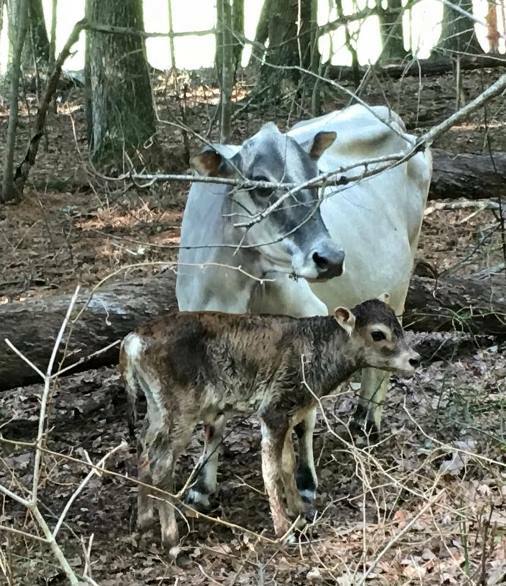 This mini jersey x zebu bull was calved on 1/20/2017. He is sired by our previous mini jersey bull Remy. He is built really well. He is going to be a nice little bull and will not be related to our calves from Tango that should start arriving soon. He left for his new home on 2/25/17. Becky, I hope that this little guy is all that you are looking for. 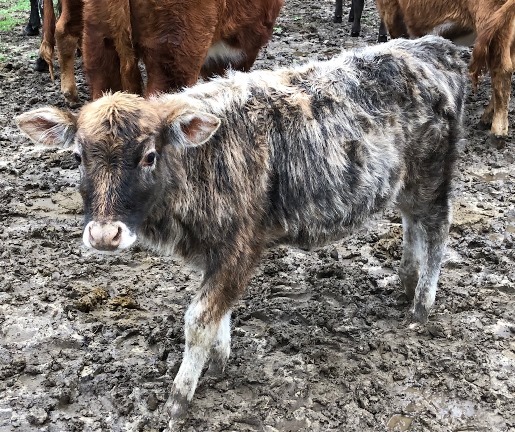 This little heifer is 1/2 lowline x 1/2 mini zebu. She was calved on 9/20/16. She is polled, no horns. 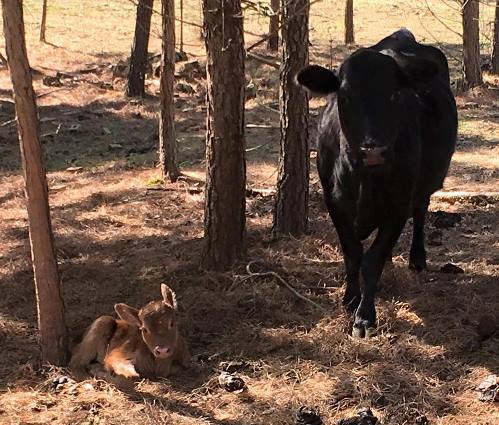 Start your own herd of mini-brangus cattle with this pretty girl and the bull calf below. She is priced at $1500. 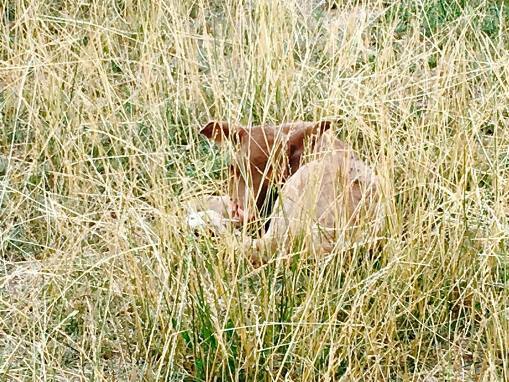 A 25% deposit will hold her until weaning at 4 months old. She was delivered to her new home on 2/25/17. This handsome little bull was calved on 6/26/16. He should add color to any breeding program! He is sired by our old mini jersey bull Remy and his dam is pictured on the left. I sure wish he had been a heifer :) He will be polled. 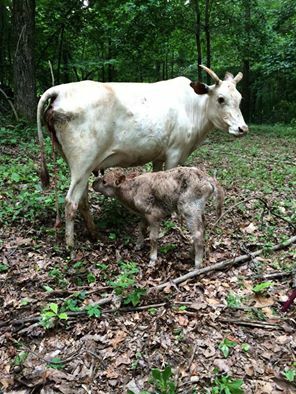 This handsome little zebu bull was calved on 6/2/16. 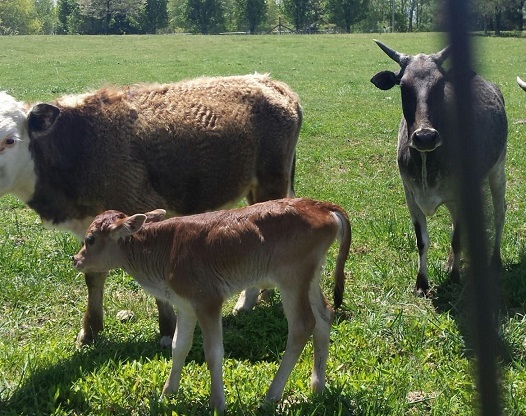 He is a purebred zebu. We bought his dam as a bred cow last year. 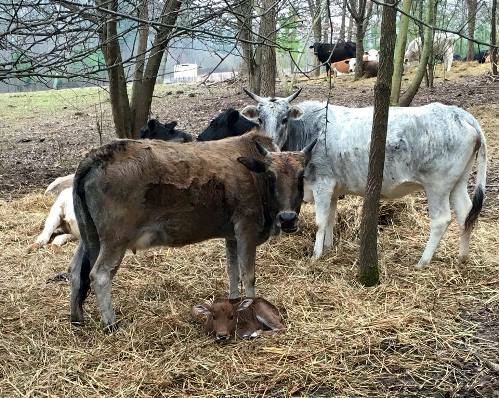 He is the last pure zebu calf that we are expecting. He can be started on a bottle is a purchase agreement is made before he is two weeks old. This purebred lowline bull calf was calved on 6/14/16. His sire is our red lowline bull Willie. He is pictured with his dam to the left. She is a purebred lowline, but isn't registered. 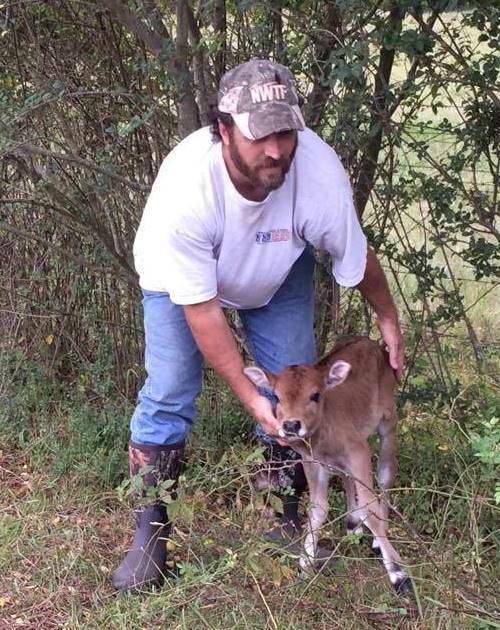 Justin, I hope that your daughter enjoys working with her new calves. 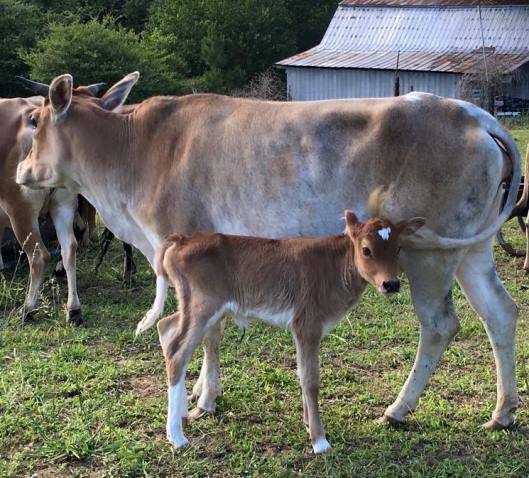 This cute little lowline x zebu heifer calf was calved on 6/14/16. She is sired by our red lowline bull Willie. She is pictured with her dam on the right. She should make a great little momma cow in a couple of years.
. Justin, I hope that your daughter enjoys working with her new calves. This little bull was calved here on 2/6/16. He is pictured with his dam. He was sired by Remy, pictured to the right. He will be ready to wean in mid June. Jesse, I hope your wife enjoys her new pet. 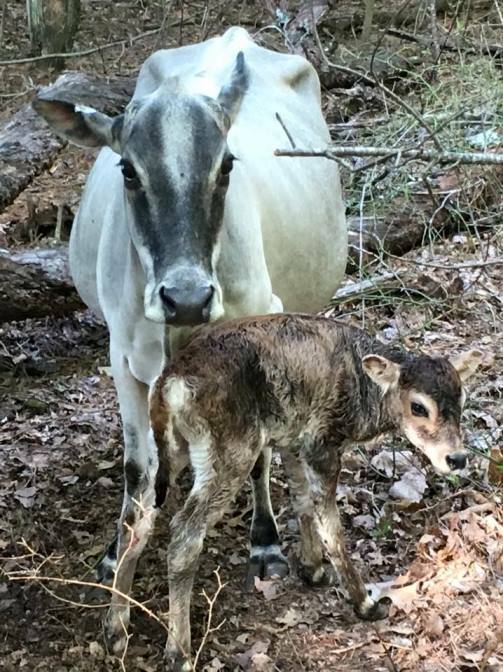 We had a new lowline x zebu bull calf on 4/14/16. He should make an awesome mini brangus type bull. If he ends colored like his mom, he will be really handsome. Don and Rae, I hope he grows into a handsome bull for you. This little heifer was calved on 7/11/16. 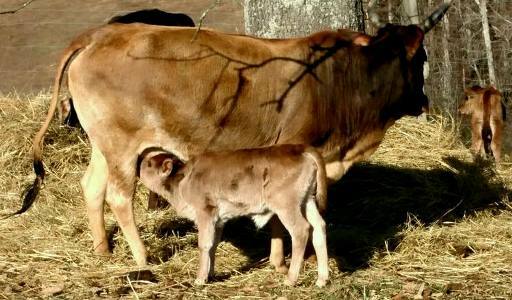 She is sired by our previous mini jersey bull Remy and out of a zebu cow. She will be bottle trained and should be ready to go her new home in early August. Ricky, good luck with the girls. I hope you enjoy your new little milk cows. This handsome little bull was calved on 1/27/16. He is out of a lowline cross cow and is sired by our red lowline bull, Willie, pictured to the right. He should mature into a nice thick bull and bring a little hybrid vigor to your breeding program. Andrew, I hope this little guy helps you build the herd that you want. I hope the piglets do well for you too. This pretty little girl was calved on 2/28/16. She is sired by our red lowline bull Willie. Her dam is a cow that was born and raised here. 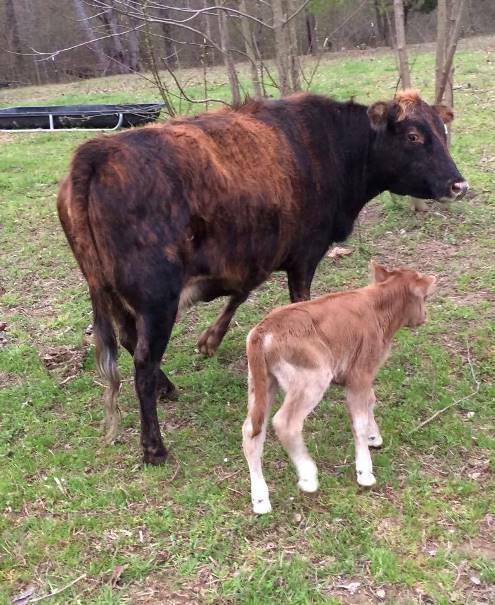 The cow was sired by our old bull Cleburne and out of cow called Penny. 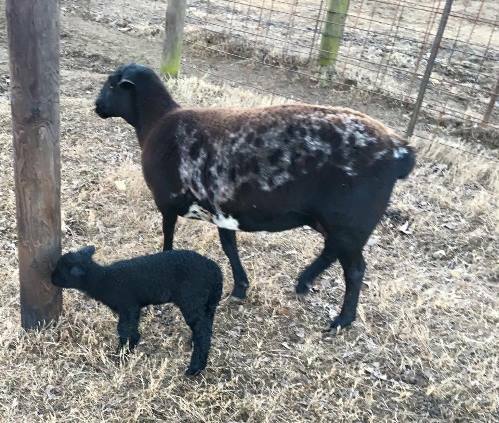 Babydoll Southdown ewe lamb, lambed on 3/20/16. She will be registered with the NABSSAR. Lisa, I hope all three of the lambs make nice ewes for you. 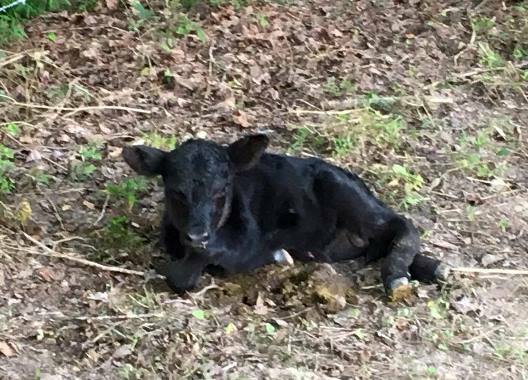 This little guy was calved on 6-6-16. He is pictured with his dam on the right. She is one of our smaller beef type cows. He is sired by our red lowline bull, Willie. I suspect he will be short and thick! Marilyn, I hope these do well for you and that you are happy with them. 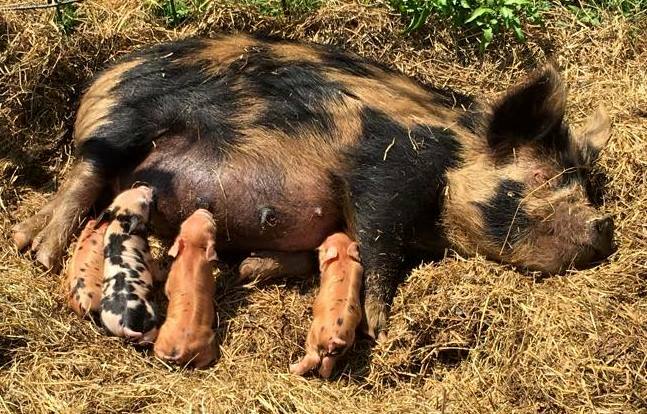 5/19/16 litter of pure KuneKune piglets. There were 5 gilts farrowed. One more arrived after this picture. She looks like the second one from the left. There are 3 of them still available. Scott, I hope these gilts help you build a great little pig herd. This pretty little heifer was calved on 1/25/16. 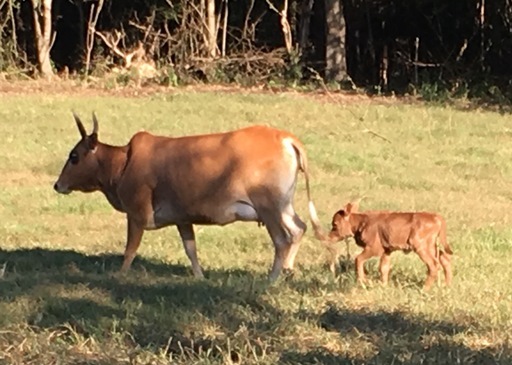 She is out of a zebu cow and sired by our red Lowline bull Wille. 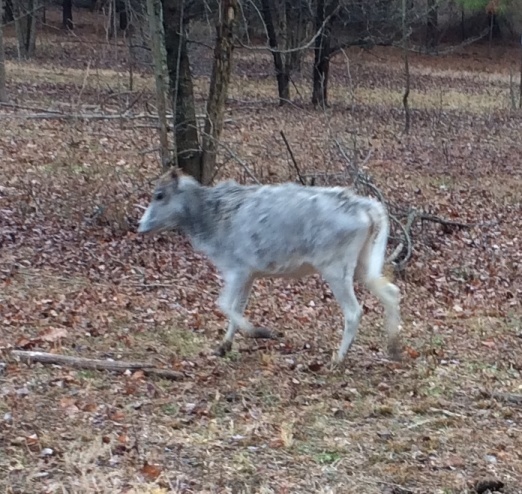 She is a fawn color now, but I think she will become brindle as she matures. She will grow up to be an awesome brood cow. Alan, I hope this little girl becomes a nice cow for you. She should pair very nicely with the bull you selected. This pretty little heifer was calved on 1/9/16. 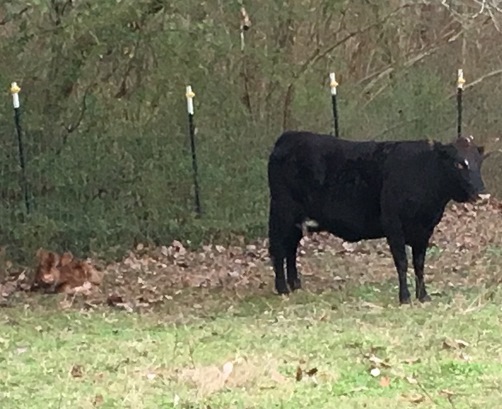 She is out of the red and white guinea piney woods cow pictured to the right. She is sired by our red lowline bull Willie. I really like her, but we are retaining several heifer calves for the mini jersey herd and I have to sell something to keep things going. She should make a nice little brood cow in a few years. . This little bull was calved here on 2/5/16. He is pictured with his dam. He was sired by Remy, pictured to the right. He will be ready to wean in mid June. 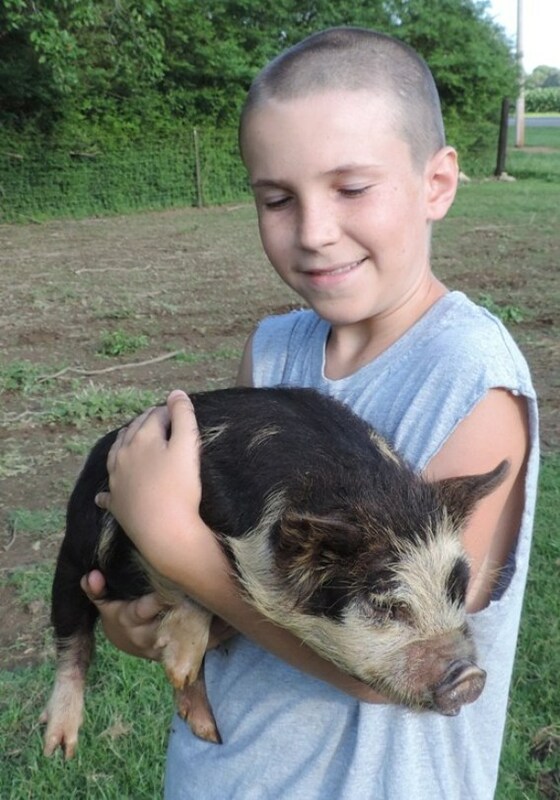 Marilyn, I hope that this little guy makes a great bull for you and your grand daughter. This little heifer was calved here on 2/9/16. She is pictured with her dam. 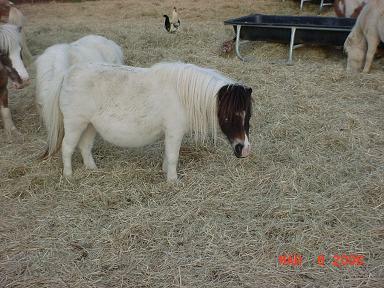 She was sired by Remy, pictured to the right. She will be ready to wean in mid June. Marilyn, I hope this little heifer makes a nice cow for you and your grand daughter. 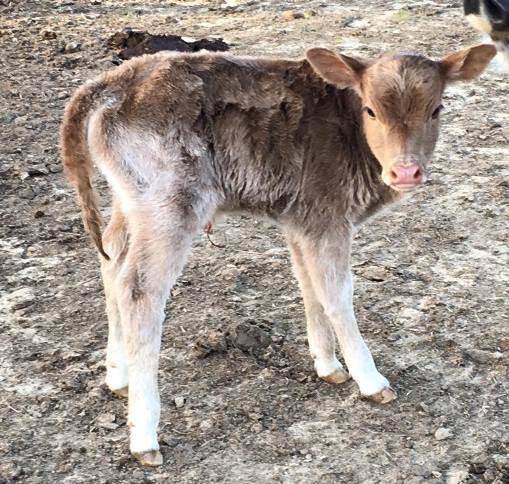 This handsome little bull was calved on 2/21/16. 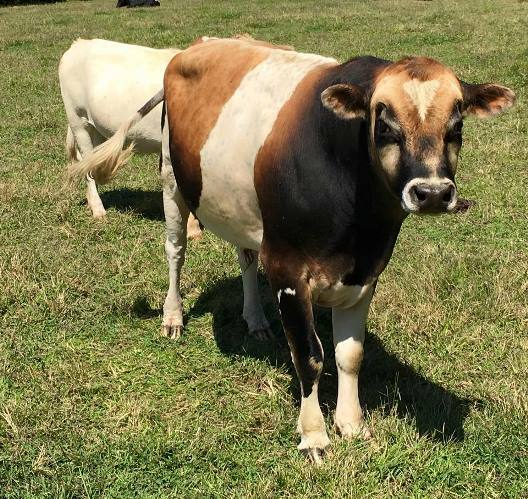 We purchased this cow last summer and she was bred to a red and white paint zebu bull when we bought her. Bryan, I hope this little makes a nice bull for you and your son. This bull was calved on 12/16/15. He is sired by our red Lowline bull, Willie. 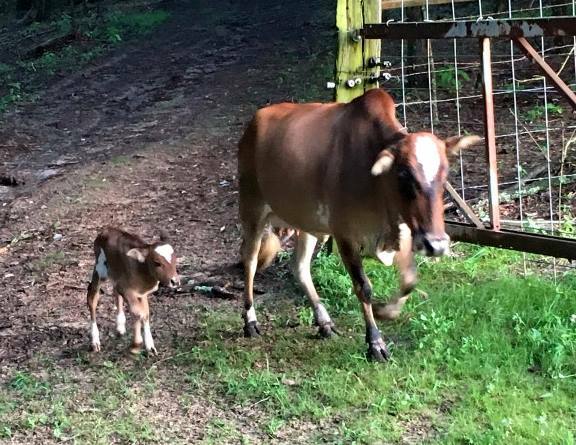 He is out of Junebug, a guinea pineywoods x zebu cow. This makes him a 3-way cross. He should make a nice bull for someone wanting to raise small hardy beef type cattle. Jimmy, I hope this bull does a good job for you. 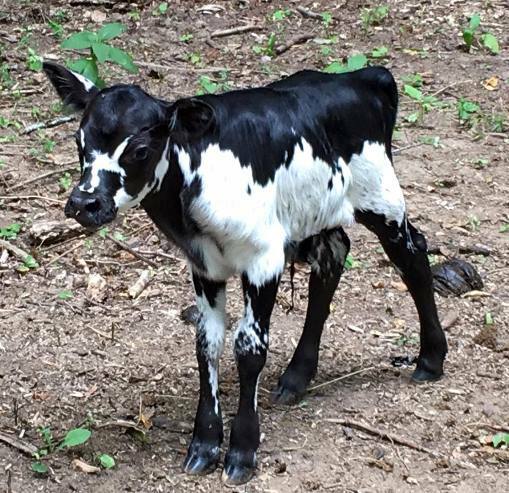 This heifer calf was born at my cousin, Kenneth's Farm. 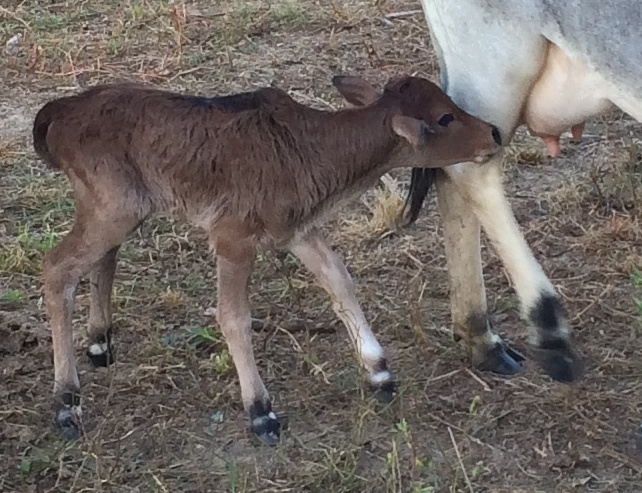 She is 1/2 mini jersey x 1/2 zebu. He dam is the zebu cow in the back ground. Her sire is our previous mini jersey bull Jake. She was calved on 4/22/16. She will be started on a bottle the weekend of 5/7/16 and will be ready to go to her new home two weeks later as a bottle baby. Helen, I hope your new girls do great for you. 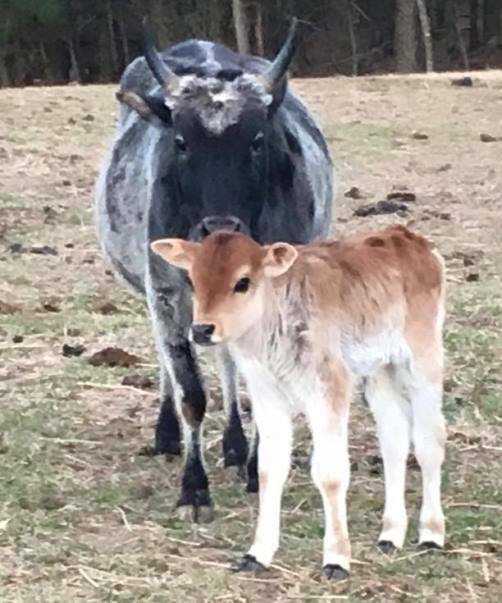 This little bull is 1/2 Dexter and 1/2 zebu. He was calved on 4/25/16. He is pictured with his dam. Amy, I hope that he does well for you in your petting zoo. This beautiful red-whitefaced heifer was calved on 4/20/16. She is pictured with her dam. She was sired by Willie, our red lowline bull. She should grow to make a great cow for someone. I am tempted to keep her, but we are already retaining several this year. Marilyn, I hope that you enjoy raising "Buttons". She should make you a very nice cow in a few years. 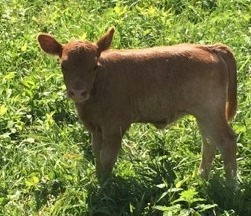 AMJA registered miniature jersey bull. Remy is 41.5 inches tall and a well mannered bull. Kenneth, I hope that he does as good a job for you, as he has for us. 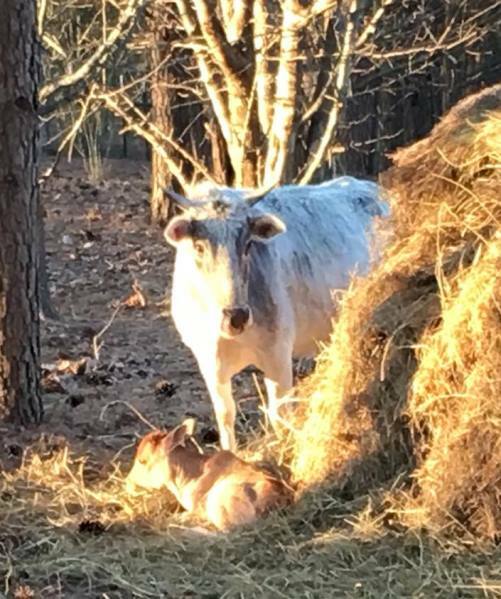 This sandy colored little bull was calved on 2/29/16. We bought this cow bred last year. 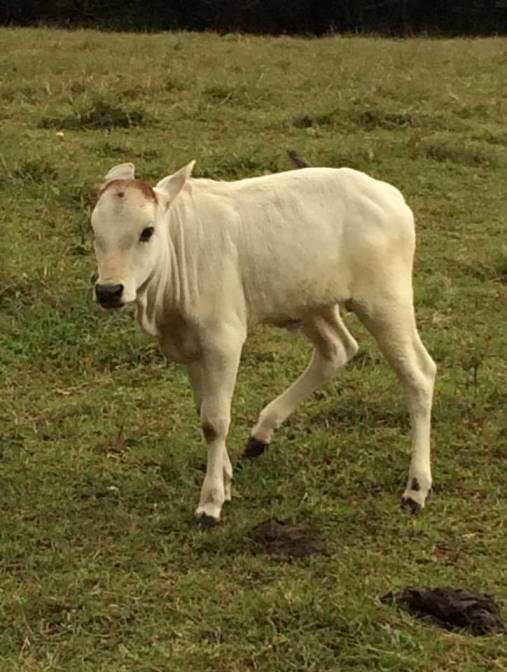 She was bred to a nice white zebu bull. Sold on 3/24/16. Thanks Joseph. I hope he does well in your petting zoo. Ewe lamb, lambed on 1/29/16. The sire is our babydoll ram. The dam is a Katahdin x Dorper. Sold on 3/24/16. Thanks Joseph. I hope she does well in your petting zoo. Buckling kidded on 1/30/16. 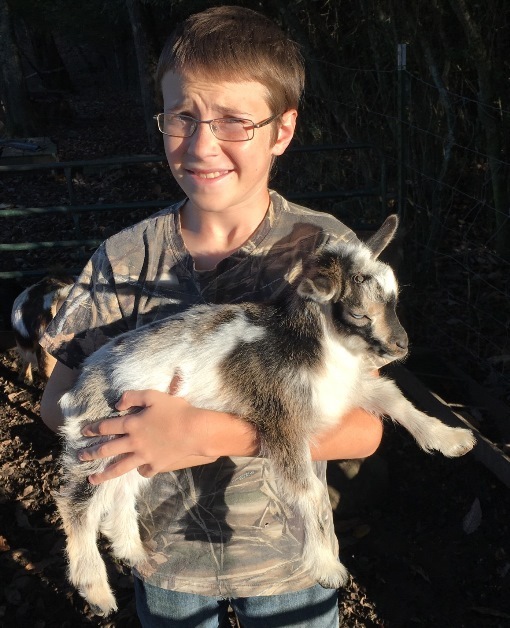 He is the last kid that we will have from our older buck Chips. It appears that the little guy is going to be polled. 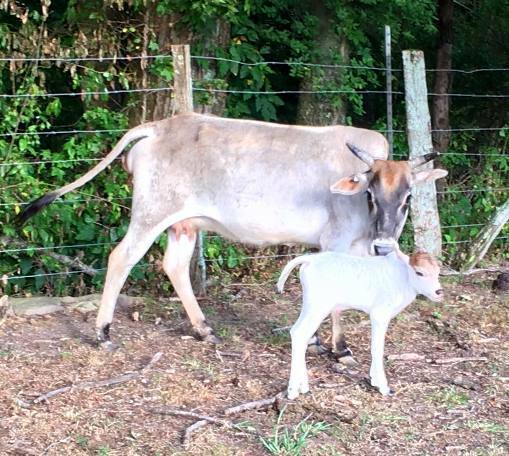 On 7/2/15 one of our brindle zebu cows had a nice little bull calf. He is sired by our red lowline bull Willie. He should make a nice bull for someone wanting to raise smaller cattle. I will try and gets some better pictures of him soon. Bronte, I hope that he makes a nice little bull for you and that your small cattle project works out well for you. This heifer was calved at Kenneth's farm.. She is pictured with her dam and is sired by Jake pictured to the right. She was calved 2/13/16. She can be bottle trained or will be ready to wean in mid June. Michelle, I hope that y'all enjoy her as much as we have enjoyed working with her for the last few weeks. She is a real sweetheart. 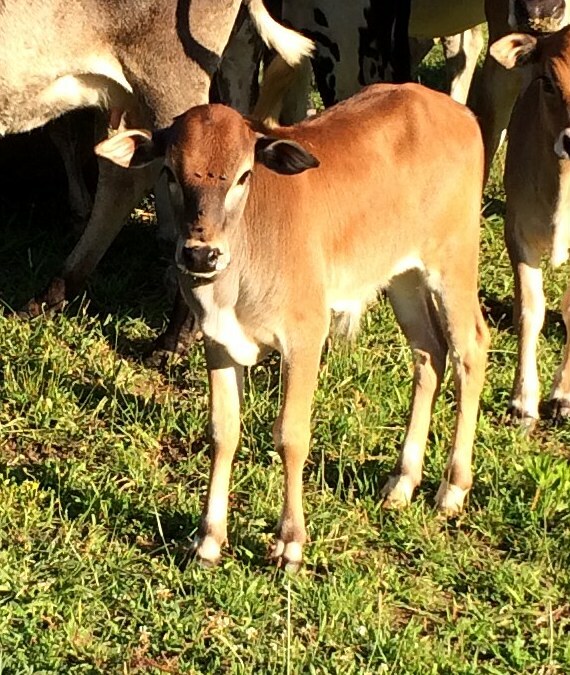 This handsome little guy is out of one of our nicer registered red zebu cows and sired by our mini jersey bull Remy. 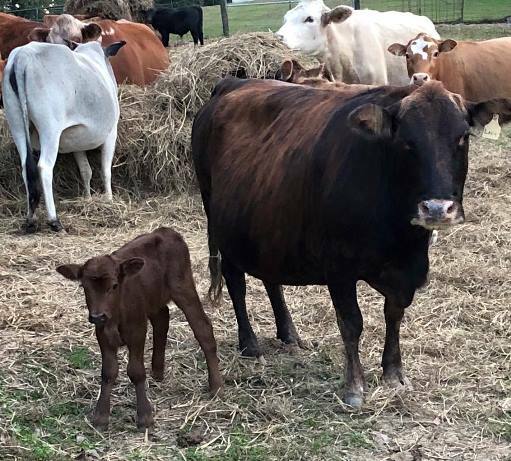 He was calved on 9/27/15. 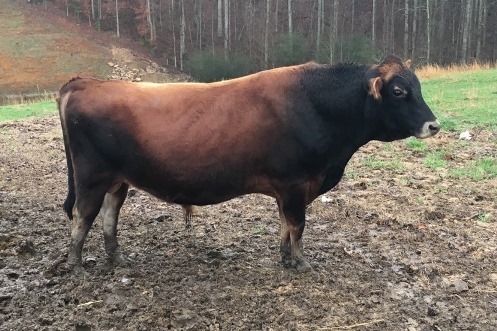 He will make a nice little herd bull for someone, or can be steered as a pet or feeder. Adrian, I hope that he makes a nice bull for you. 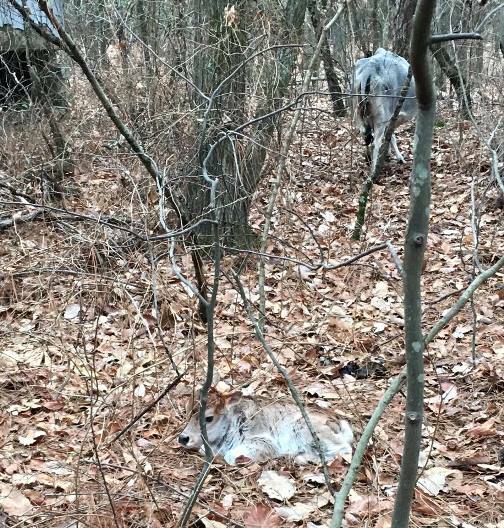 Light buckskin buckling with moonspots and blue eyes, kidded on 10/20/15. Thanks, Melissa. I hope he does an awesome job for you. 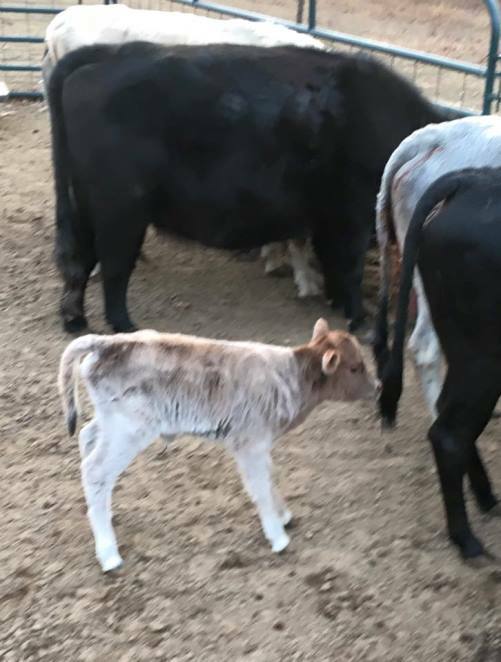 We purchased this zebu bull calf with a group of cattle we purchased. He should make a nice bull. His sire was about 42 inches tall and his dam is about 40, so he will be a good sized bull when mature. Thomas, I hope that this bull makes a nice herd bull for you. 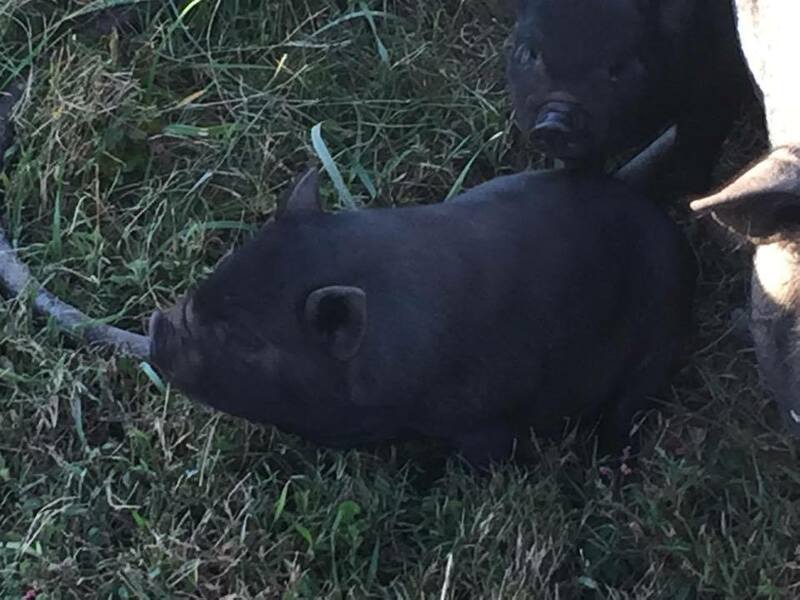 We have three piglets that were born at a friend's house. 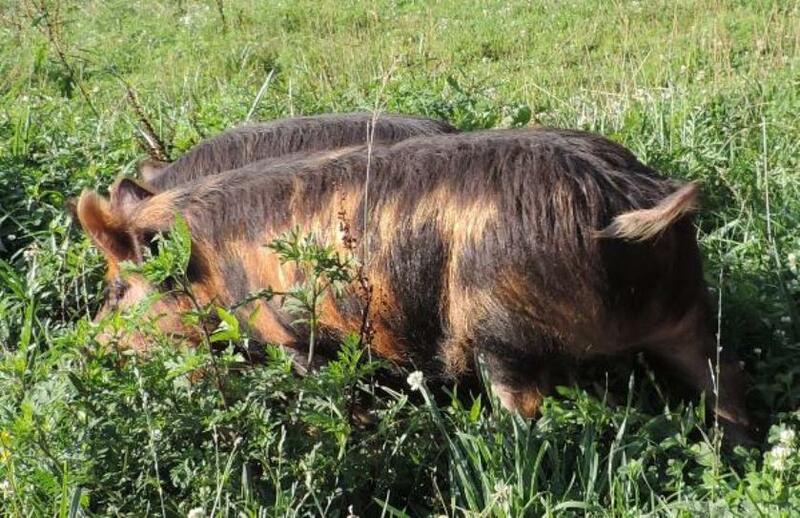 They are sired by a pure kunekune boar and are out of larger potbelly sow. 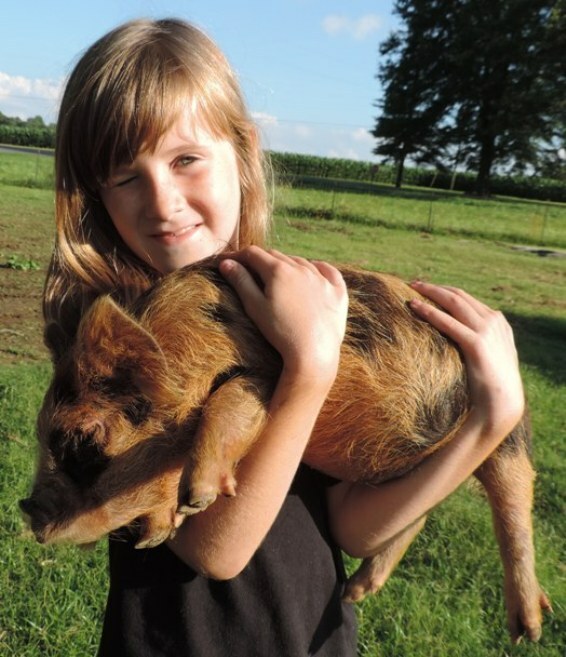 I think that they will mature at close the same size as our kunekune x american guinea hog piglets. Thanks, Kelli and Rory. I hope that y'all enjoy them. 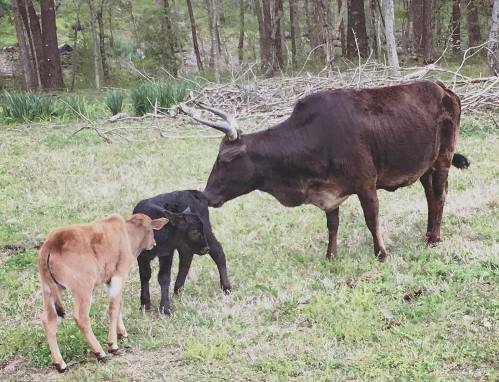 On 6/5/15, Buttercup had a bull calf with her today. He is a "Dynamite" little bull. He is barely dry, but is running and bucking all over the pasture. 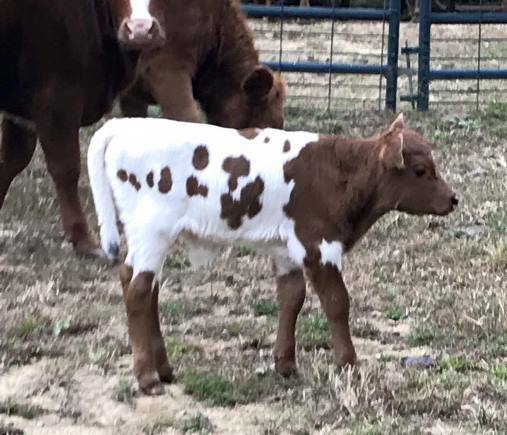 He is 1/2 lowline and approximately 3/8 mini Hereford and 1/8 zebu. He will make someone a super little herd bull. Thanks, Kelli and Rory. I hope he does well for you. 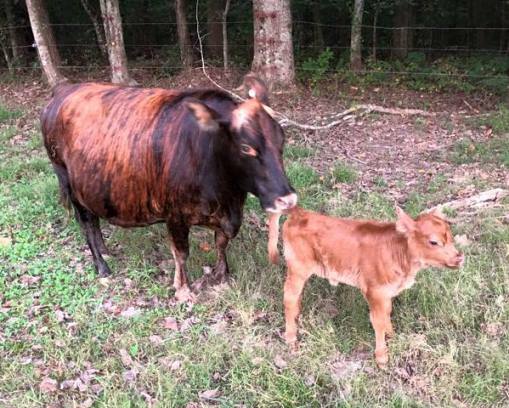 On 7/2/15 Huggs had a beautiful little heifer calf. She can be pulled and started on a bottle. 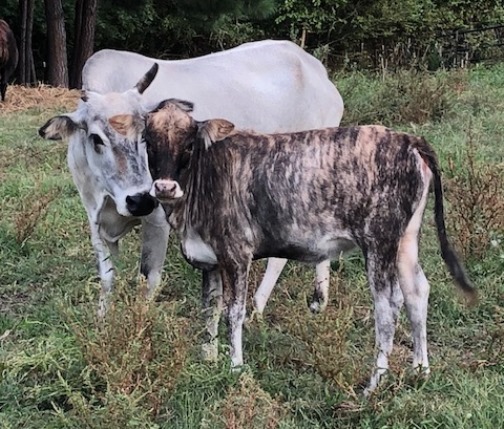 Huggs has a very nice udder for a zebu, so that added to being sired by our mini Jersey bull, Remy, should give this little girl all the genetics she needs to make a wonderful little homestead cow. Kendee, I hope that she does well for you and the kids enjoy having her there. 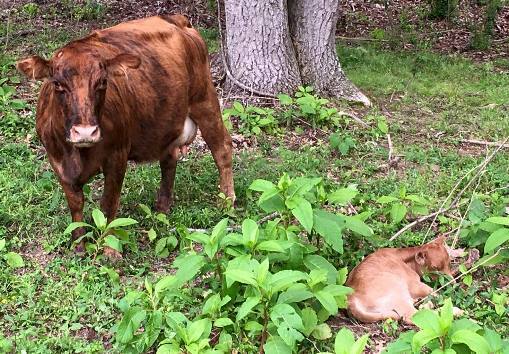 On 5/23/15, our brindle heifer Annie had a gorgeous little heifer calf. She is 7/8 lowline or angus and 1/8 zebu. Kelli and Rory, I hope all the little heifers do well for you. 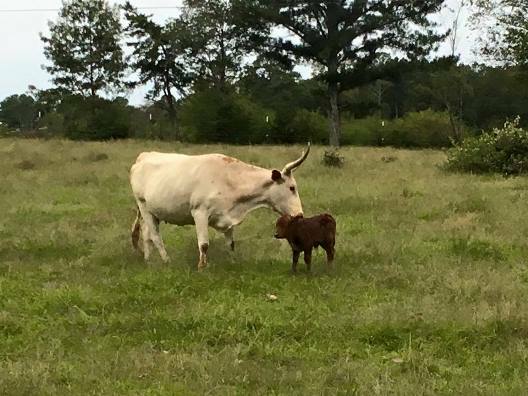 We have a bull calf that was calved on 9/10/15. 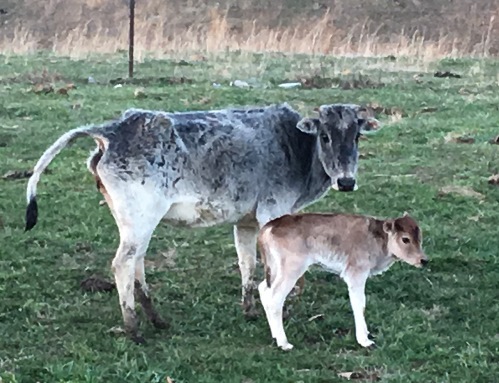 He is sired by our mini jersey bull Remy and is out of one of our best zebu cows Lucy. He looks mostly white in the pictures, but it actually a pale tan with faint brindle stripes. He will likely get darker as he gets older and look a lot like his mom. He is polled. Paul, I hope he does well for you in your petting zoo. 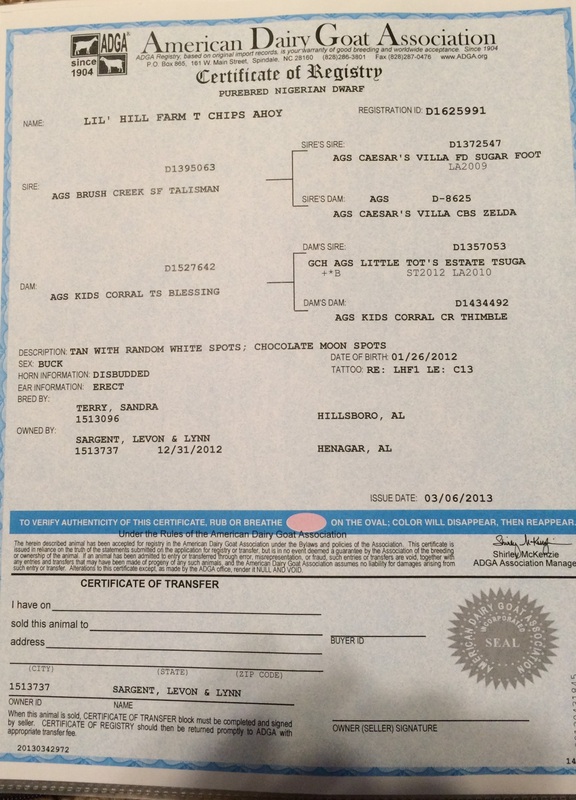 ADGA registered buck for sale, $250. Chips has sired some colorful kids for us. He can do the same for you. Chips has moved to Arkansas. 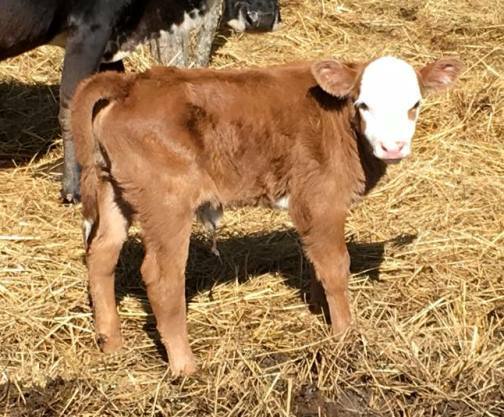 This little guy is sired by our Lowline bull Willie and out of one of our crossbed cows, Lacy. She is in the picture to the left. He has faint brindle stripes on him now, but I suspect that they will get darker as he gets older. 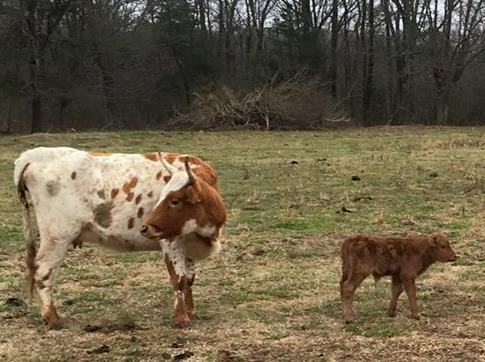 He was calved on 3/21/15. He is an excellent bull prospect. Thomas, I hope this little guy does a great job for you. 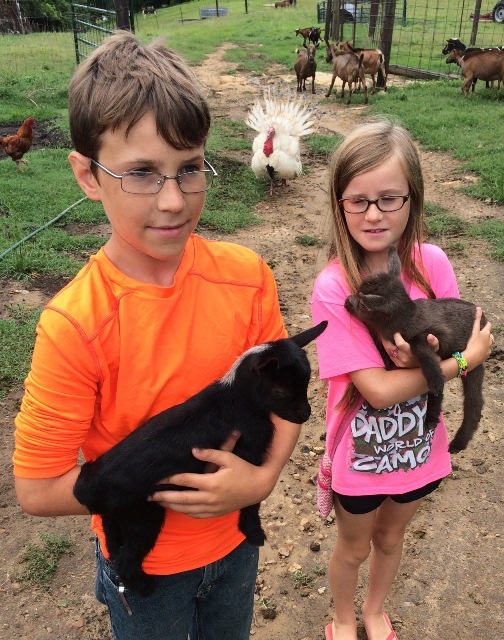 Kelli and Rory, I hope your kids enjoy the new kids as much as they have the piglets and calves. 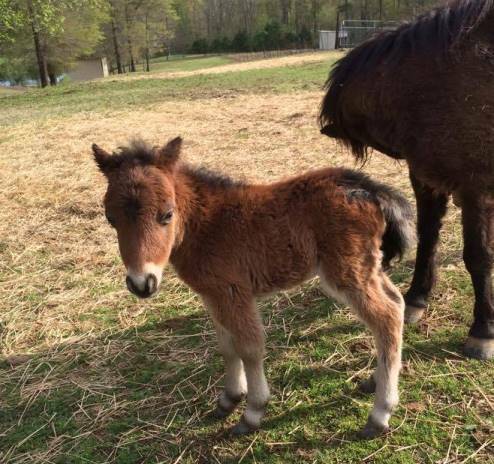 On April 12, Ruby had a handsome little bay colt. The kids are enjoying him, but we don't have room for an extra stallion. Carla and Kenneth, I hope that you have fun with this little guy. This little bull is out of one of my favorite cows, Dallas. He was calved on 3/8/15. 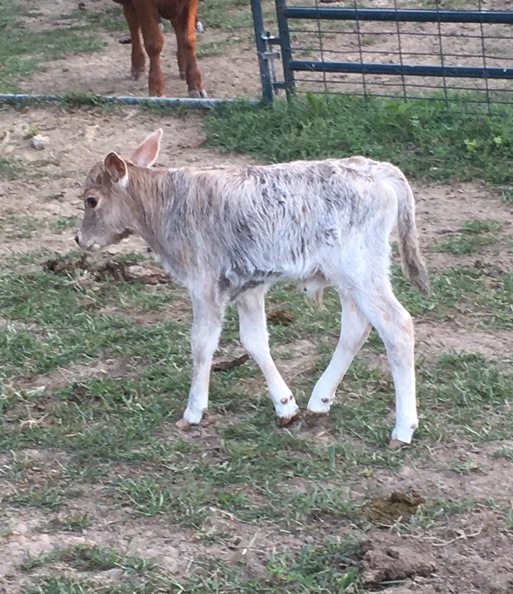 He is 1/2 mini jersey, 1/4 zebu and 1/4 mini shorthorn. He should make a nice bull in just a little while. He is also sired by Remy. He appears to be roan. Thanks Kelli and Rory. I hope he makes a great bull for you. 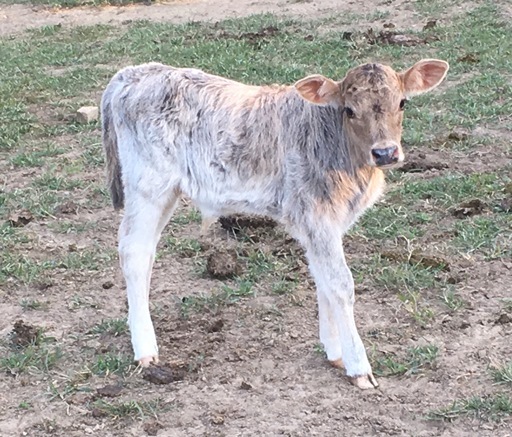 This is small zebu cross bull calf that was calved on Kenneth's farm in early January of 2015. He had thought about keeping him, but he is just too small for his breeding program. He has some type of dilution gene that gives him this coloring. He is now a steer. Thanks Kelli and Rory. I hope he makes a great steer for you. 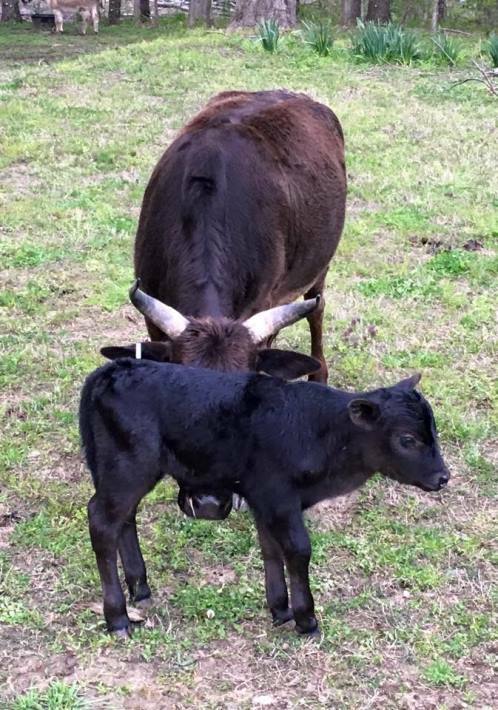 This little bull is out of a zebu cow and sired by one of Kenneth's crossbred bulls. He should make a nice sized bull. He is brindle and is growing well. He is now a steer. 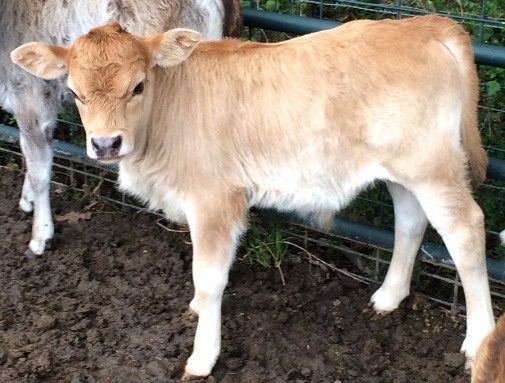 This mini jersey x zebu heifer is sired by Kenneth's mini jersey bull, Jake. 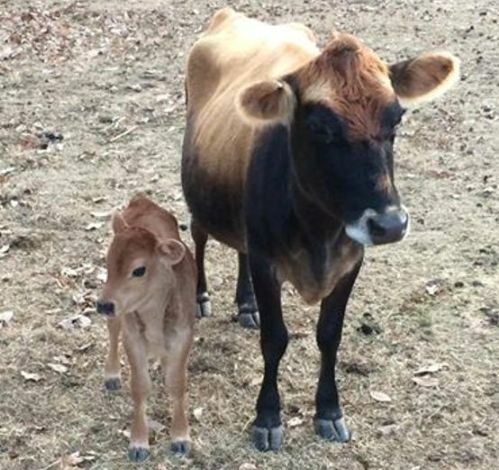 She is pictured with her momma. She was calved on 3/5/15. 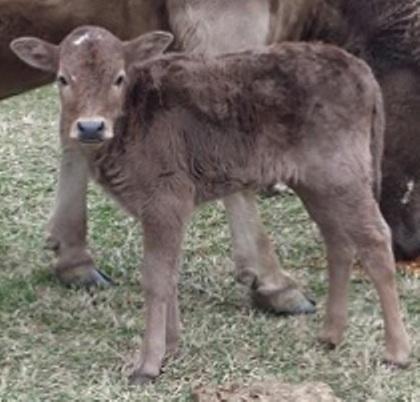 Kenneth also has a younger mini jersey x zebu heifer that I don't have a picture of yet. Rachel, I hope the littler heifer makes a nice milk cow for you. John, I hope your wife is happy with the new heifer. 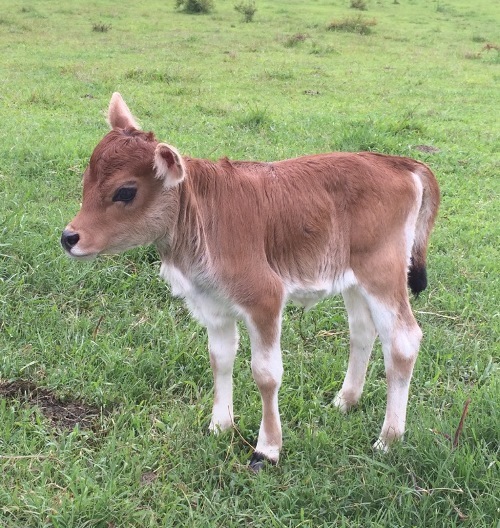 This handsome little guy is 1/2 mini jersey and 1/2 zebu. He looks like he may be brindle colored like his mamma. He should make a nice bull. Mike, I hope that your grandson enjoys his new pet. 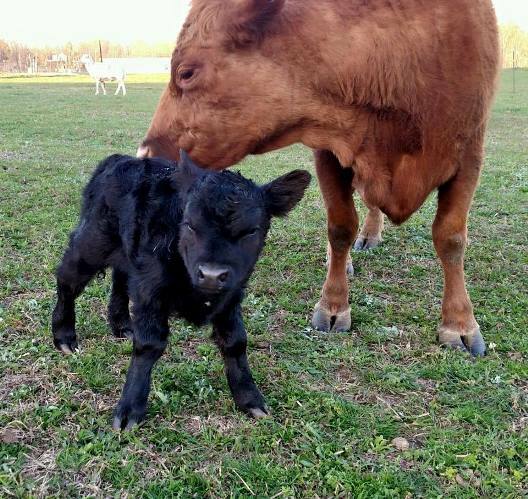 This bull calf was born on 11/4/14. He is a curious and friendly little guy. 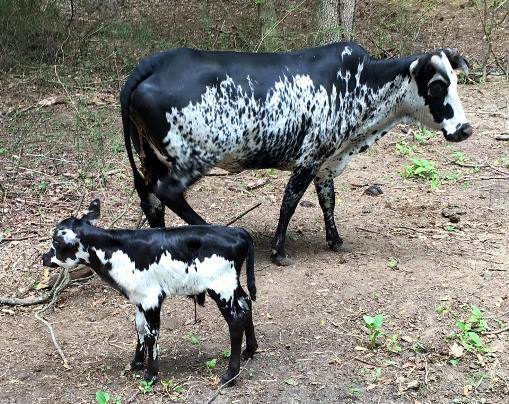 His mother is an unusual color for a zebu. His sire was brindle colored. Calves often change colors as they mature too, so I am not sure what he will look like when he is older. George, I hope that he and the little heifer do well for you. This handsome guy was calved on 11/15/14. He is 7/8 mini jersey and 1/8 dexter. He will make a great herdsire for some interested in raising smaller dairy cattle. Brandy, I hope that he makes a nice herd bull for you. Kenneth had a nice little composite bull born at his place a few days ago. He is out of a black baldy heifer that he got from us. 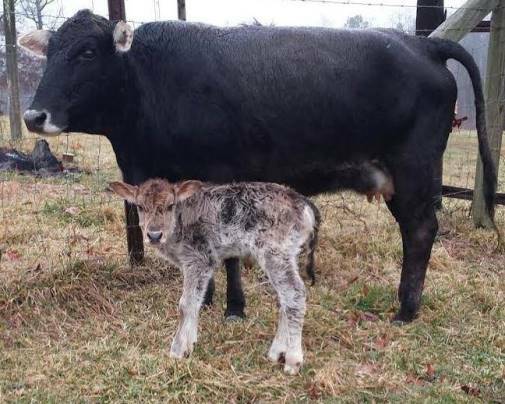 This is her first calf and is sire by his mini-hereford x zebu bull. Keith, I hope he and the heifers all do well for you. This zebu bull was calved on Sept 26. He is a nice little guy. 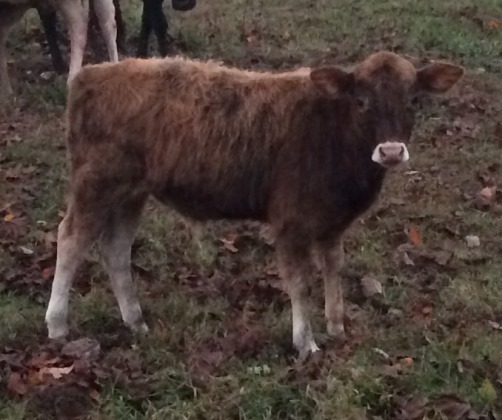 This little zebu bull, a heifer calf, a breeding pair of kk x agh piglets and a barrow were all sold on 11/22/14. It will still be a few weeks before everything makes it way home. Donna, I hope these all do well for you as you get you farm started. This little bull was calved on 4/24/14. 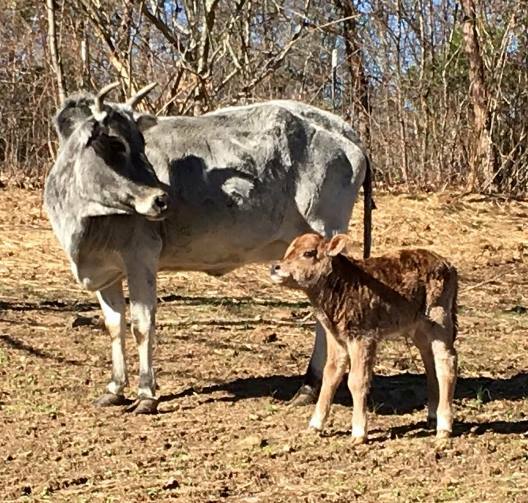 He is out of a registered zebu cow and our purebred mini-jersey bull Remy. 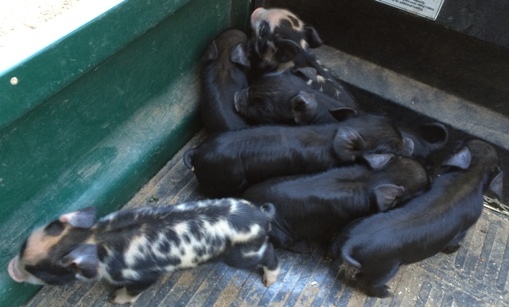 Norma, I hope that the little bull and the piglets below do well for you on your farm. Thanks. 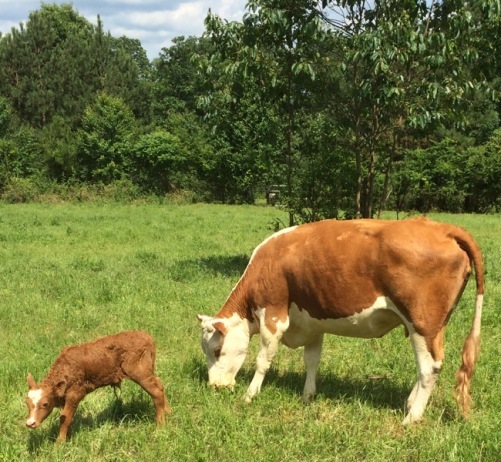 This nice little mini jersey x zebu heifer was calved on 5/29/14. 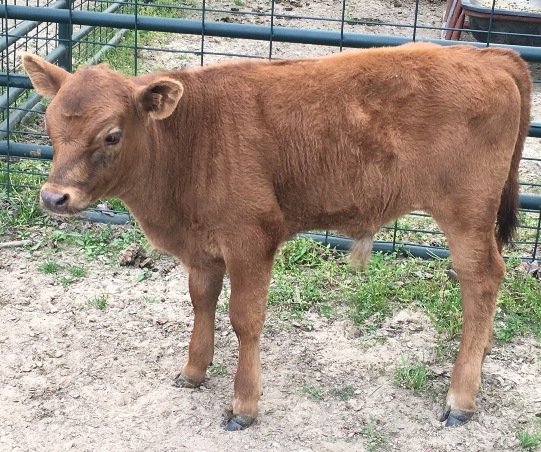 She will be bottle trained and sold with new calf halter and lead. 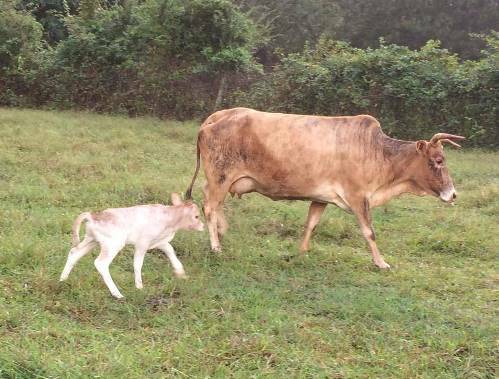 Her dam is one of Kenneth's zebu cows and the sire is our Purebred bull "Remy". Brandy, I hope that she makes a great little cow for you. 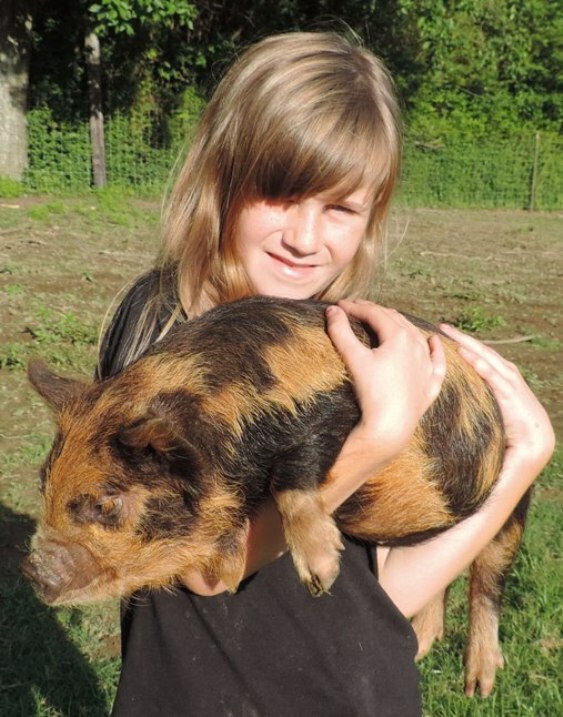 Steve, I hope that your children enjoy the KuneKune boar and the Guinea Hog gilts. This little bull was calved on 8/6/14. I believe he is the smallest calf that we have ever had here. He is just timy. 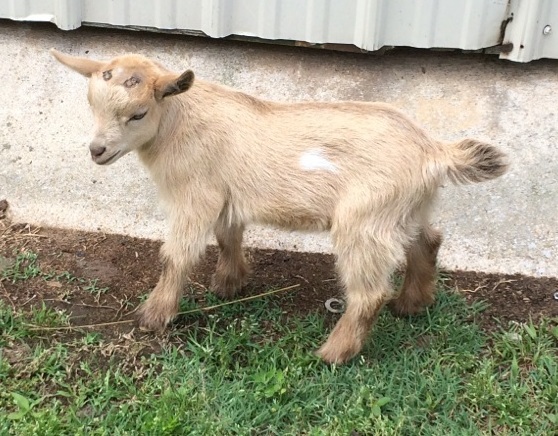 Linda, I hope this little guy makes a great addition to your petting zoo. Linda, I hope all three heifers produce many nice calves for you. 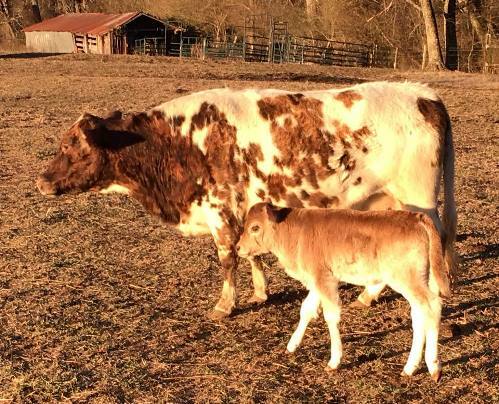 Our heifer Annie had her first calf on 4/2/14, a handsome little bull. He looks black in the picture, but he is actually a very dark brindle. In person, you can faintly see the stripes on him. He is 5/8 Lowline and 3/8 zebu which makes him a miniature Brangus. Numerous studies have identified 3/8 as the ideal portion of Brahman influence. He should make a nice little herd bull for someone. Linda, I hope that he makes a great herdsire for you. Thanks. The buck on the left and the wether on the right were sold on 7/28/14. Raeana, I hope that they do well for you. 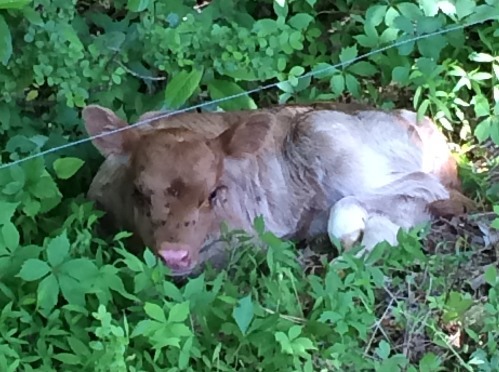 This little heifer was born at Kenneth's farm on 4/12/14. 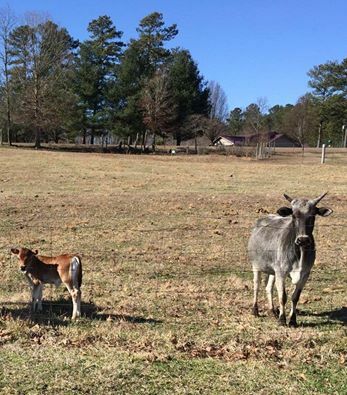 She is out of one of his zebu cows and sired by our mini-jersey bull Remy. She should make a nice little milk cow for someone. Thanks, Vanessa. I hope that she makes a great little home milker for you. 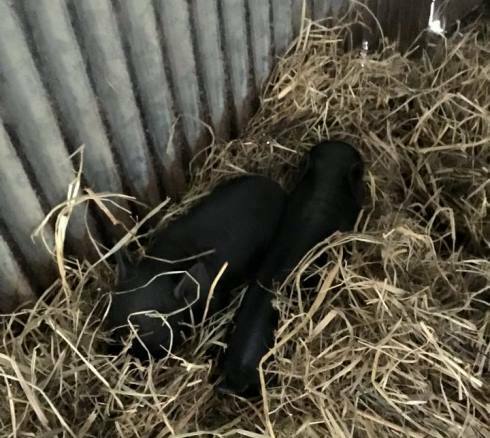 Stephen, I hope this pair of kunekune piglets do well for you. This is a handsome little mini jersey x zebull bull calf. 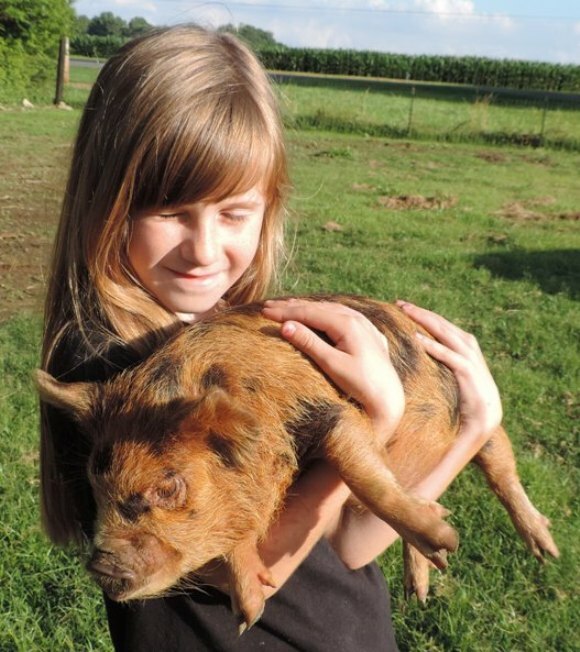 He came from the same farm as the kunekune piglets below. He should pair well with some our heifers since they will not be related. 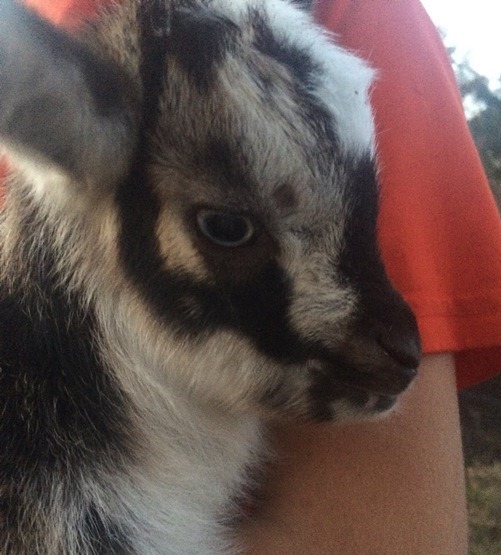 He does have horns, but is that light fawn and white. Thanks, Erin. I hope that he does well for you. Junebug had a handsome bull calf on 2/2/14. He is brindle colored. 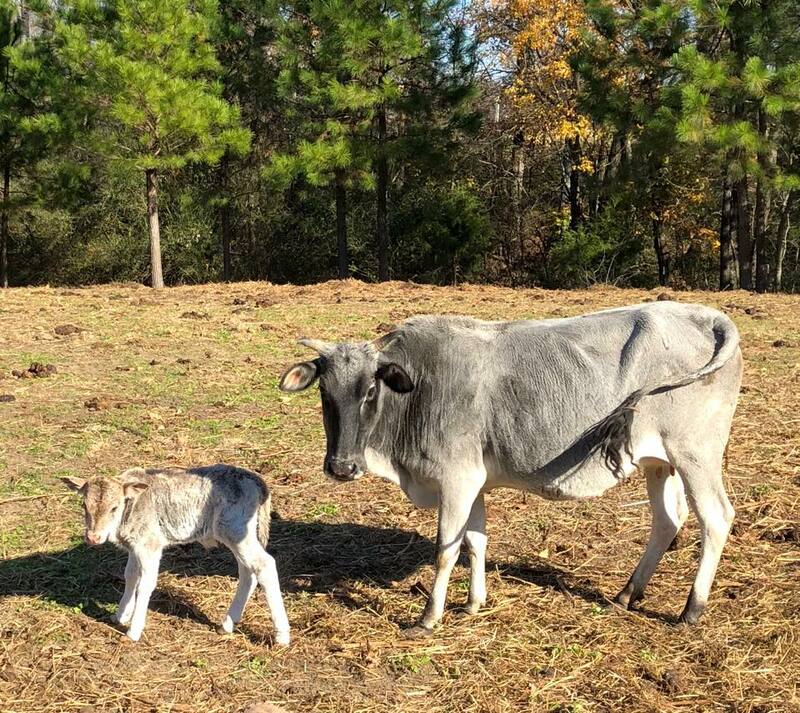 He is 50% zebu, 25% lowline and 25% Guinea Pineywoods. He would be great to pair with one of the dairy heifers we will have later this spring. Clint, I hope these little bulls workout well for you on your farm. 3/31/14 Lacy had a handsome little bull calf with her at feeding time. He is sired by Cleburne. He already has a nice little hump on his shoulders. 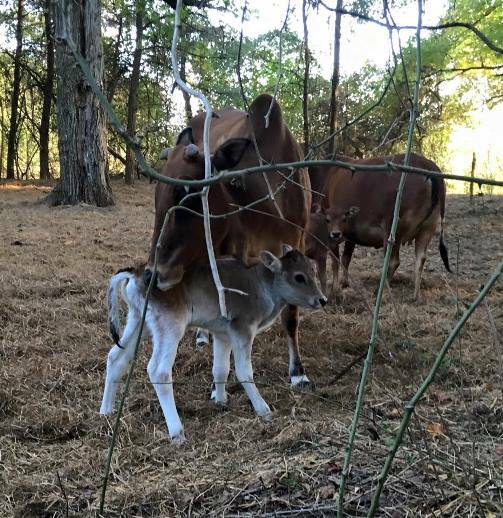 We have a nice little mini jersey x zebu heifer that was calved on 5/12/14. She will be bottle trained. Her dam is one of our smaller cows and the sire is our Purebred bull "Remy". Mary, I hope that you are happy with your new little heifer. Meet "Sir-Loin" he was calved 3/6/14. 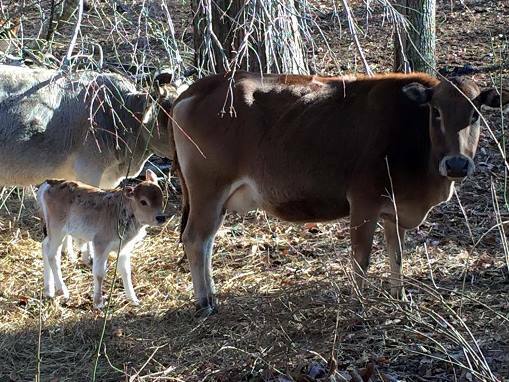 He is out of a registered zebu cow and sired by Remy, our full blooded miniature Jersey bull. He is polled. It was my intention to band the first jersey x zebu bull calf that we had here as a feeder calf for our freezer. However, this cow has such a nice udder that I am going to offer him for sale as a bull. Mary, I hope that you are happy with your new little bull. 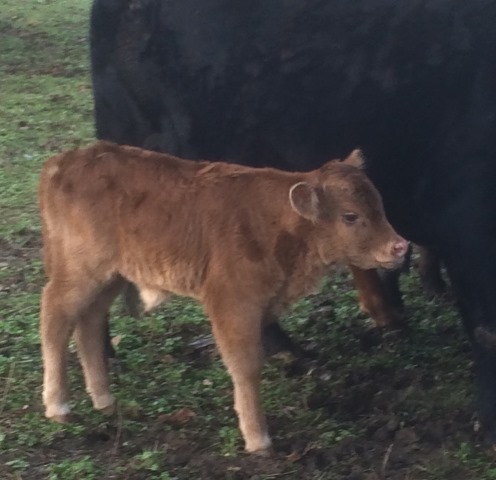 This little fella was calved on 1/24/14. 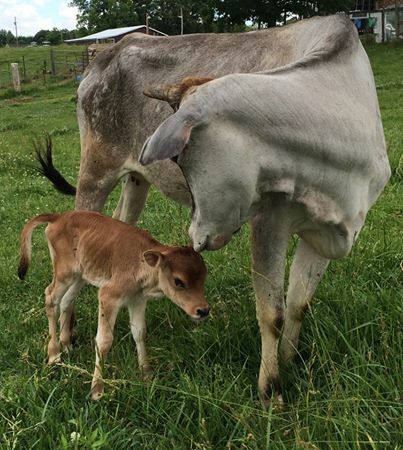 He is 50% zebu, 25% lowline and 25% mini shorthorn. Sue, I hope this little guy and the heifer do well for you. 7/6/14, this little guy left for his new home in south MS. 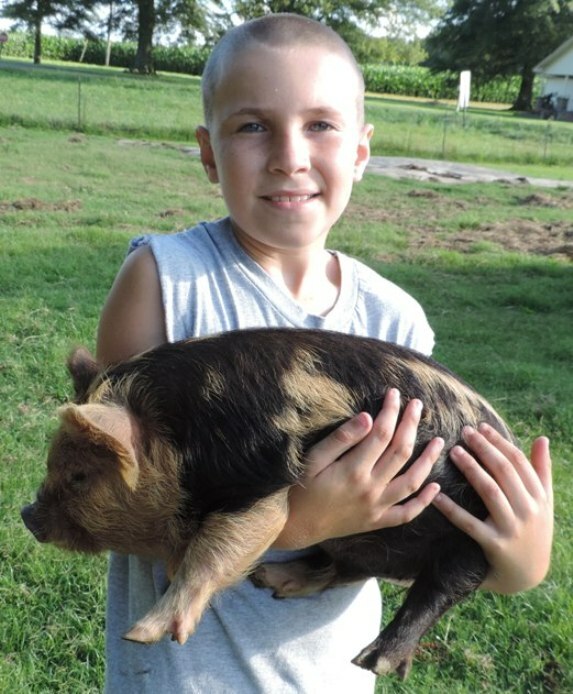 He has a few gilts to keep company. Adam, I hope he does a good job for you. 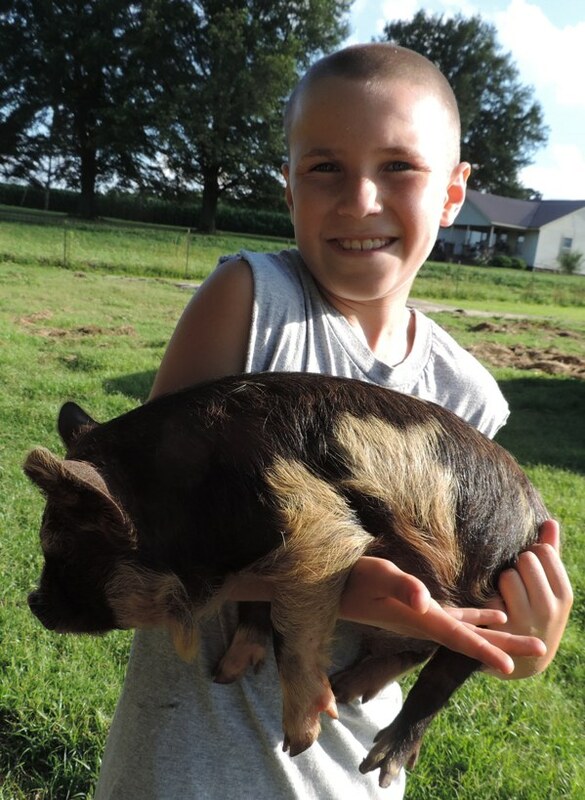 7/1/14, this little kunekune boar left for his new home. 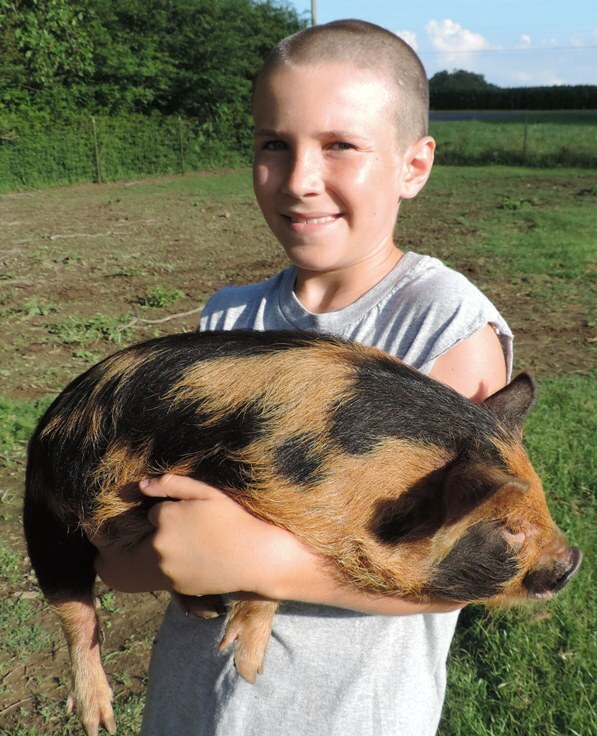 He will be keeping a few of crossbred gilts company. Lisa, I hope that he sires some pretty little piglets for you. F17 and F17 are twin does kidded on 6/16/14. They are sired by Seq. 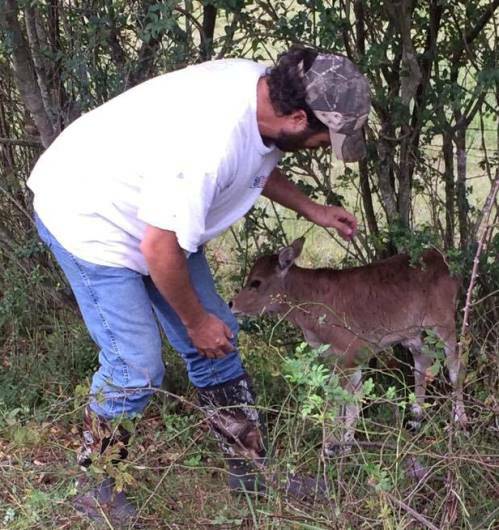 Bill and out of a home raised doe. The lighter of the two has quite a bit of white on her flanks. It is hard to see in these pictures. They are priced at $400 each. Thanks, Lisa. I hope these do well for you too. 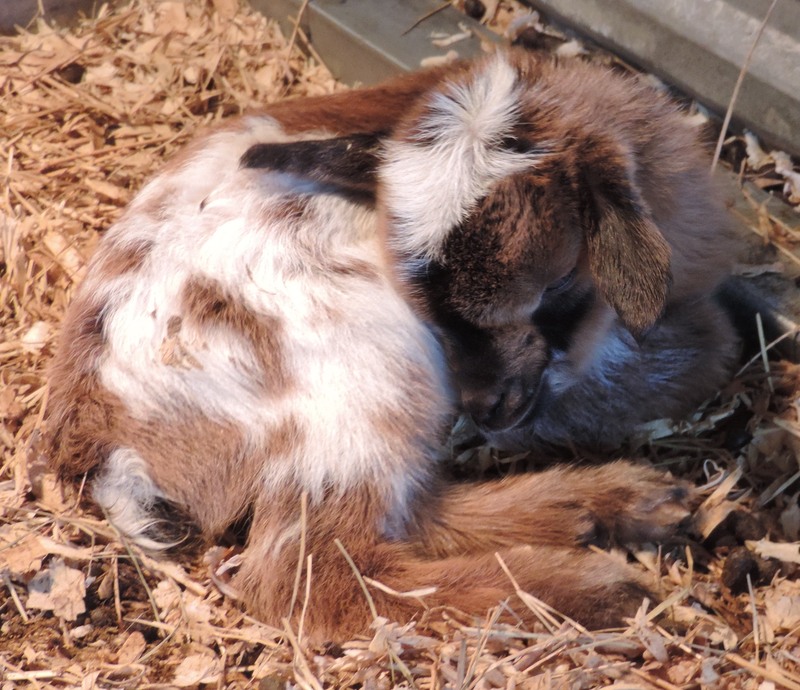 Triplet does born on 4/30/14. We will be retaining F2, the one toward the front with moonspots. 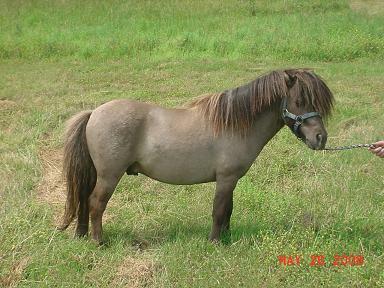 F3 the other buckskin and F4 the dark buckskin and white does will be for sale. They are sired by our older buck Seq Bill and out of a young Warrior Mountain Doe. They are $400 each and would pair well with the buck pictured below. 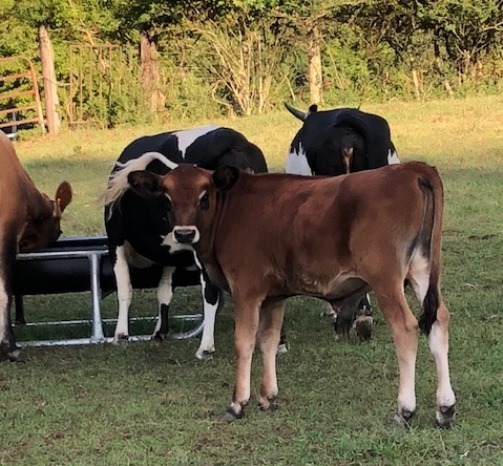 Lisa, I hope these girls get your herd started off right ! This handsome little buck was born on 4/27/14. He is sired by our younger buck Chips and out of a Creekbend Meadows doe. You can see it here, but he has a nice star. He is $250 as a buch or $75 as wether. Lisa, He should be a super buck for your new girls. This is a very small heifer that was calved early last summer. I doubt that she will ever make it past 34 or 35 inches tall. She is just a little too small for what we are trying to do, but she might be just what you are looking for. She would pair well with "Red" listed above. Edwin, I hope that she makes a good cow for you. 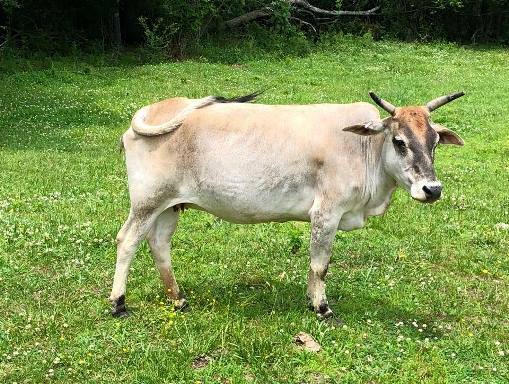 This is a 15 month old zebu bull. 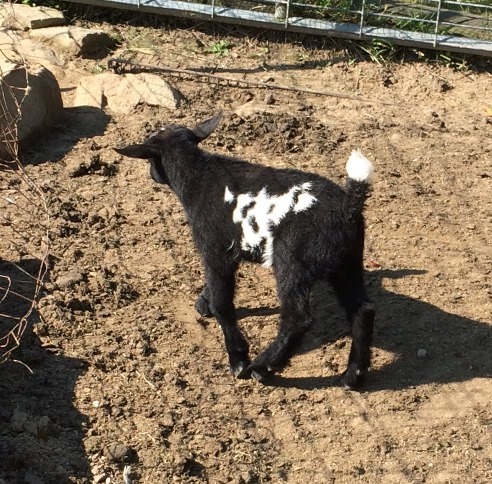 He is black with a few small white markings. He should make a nice herd bull. Edwin, I hope that he makes a good bull for you. 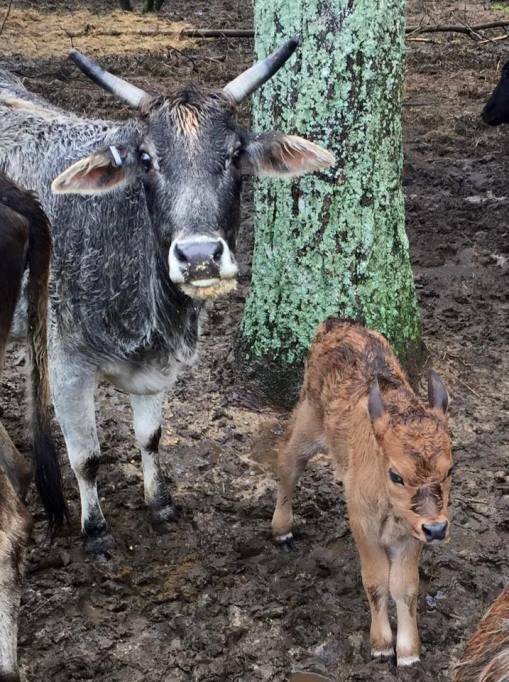 Valentino is a yearling zebu bull calf. He has excellent conformation and should make a nice breeding bull. Carol, I hope that he does well for you and that you are happy with him. Sold on 5/17/14. This zebu bull is 15 months old. He has excellent conformation. 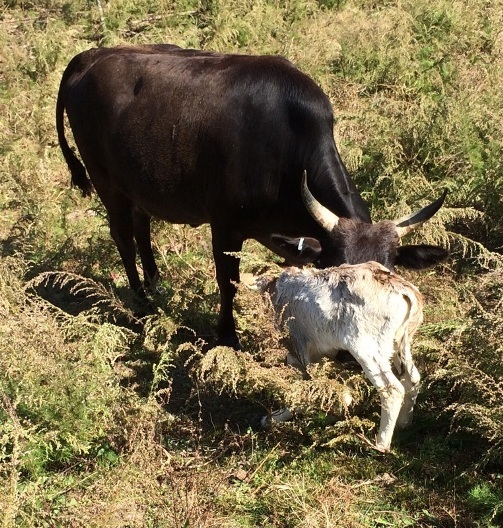 HE is solid black which is not very common in the zebu. He should make a great herd bull. Mark, I hope he produces some great calves with your lowline cows. This is Cleburne. He was calved in 2008 and came to our farm after weaning. He is 1/2 lowline and 1/2 zebu. He has produced numerous calves for us. However, it is time for a change for us. 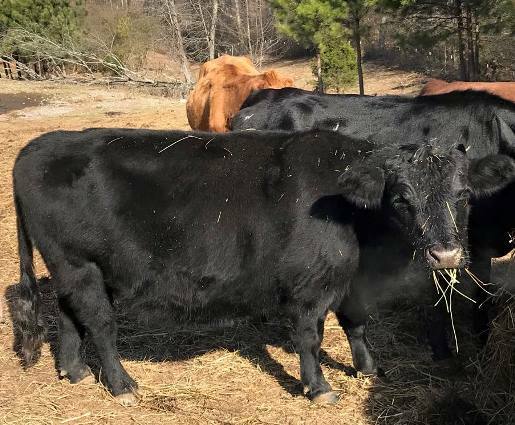 We are searching for a new fullblood lowline bull to take over breeding duties here at the farm. B&W's Gold Dun Boy is a lineback dun stallion. AMHA #A132015, foaled 2002. Gold Dun Boy is put together very well and is a double dilute. He carries both the dun gene and cremello. Depending on the color of the mare he is bred to, he can sire cremello, palomino, buckskin and the dun can be passed to any foal. He has given us some wonderful foals. Tricia, I hope he sires many wonderful foals for you. This is Delilah. 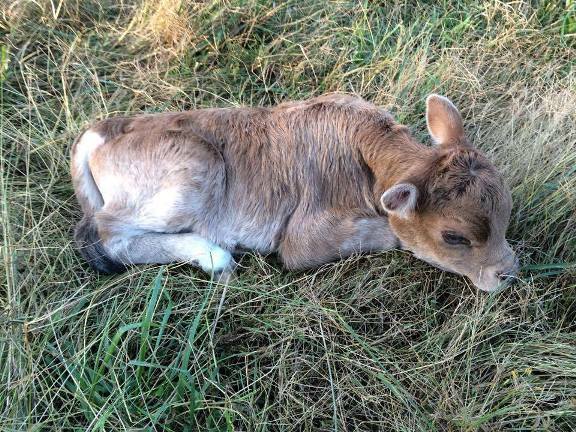 She is 1/2 miniature jersey and 1/2 zebu. She will be registered with the AMJA&R. She was sold on 1/12/14 as a bottle baby to be a future milker. Christine, I hope that she works out well for you. B&W's In The Limelight is a sorrel pinto. AMHA# A115442, foaled 2000, 29.5 inches tall. Jan, I hope that she does well for you. D42, a gorgeous little doe was born on 11/27/13. Jan, I hope that she has many beautiful kids for you. We had handsome twin bucklings born on 11/21/13. Jan and Kenneth, I hope that they sire many kids for you.